Now, let’s face it. 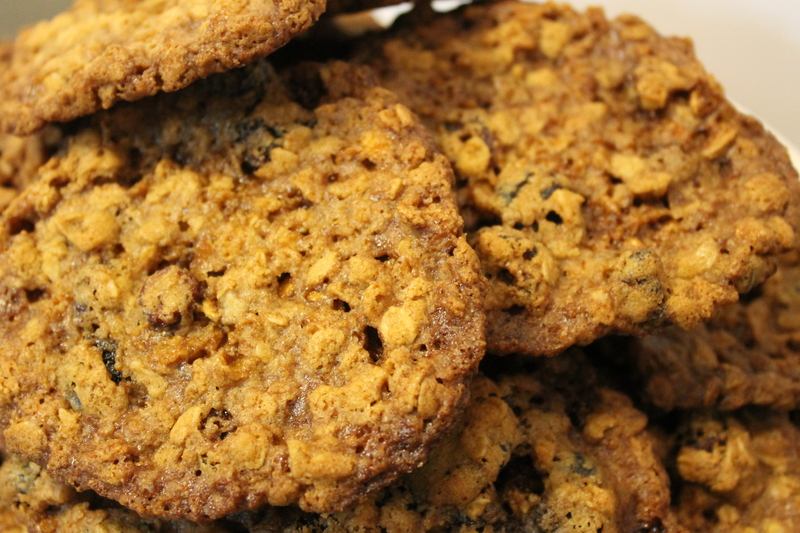 Oatmeal cookies kind of get a bad reputation. 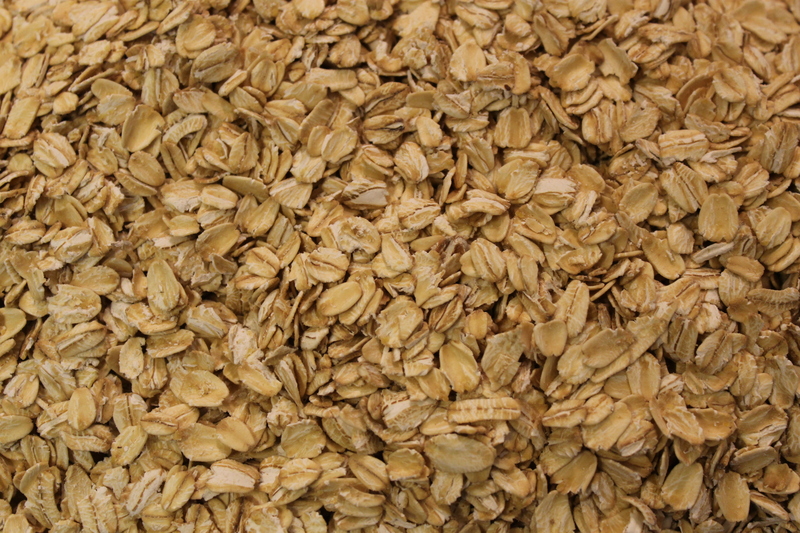 Basically, well, because they’re made mostly of what many people consider the most healthy yet mushy and tasteless breakfast food of all – oatmeal. And, usually raisins – which I personally consider to be Satan’s candy. 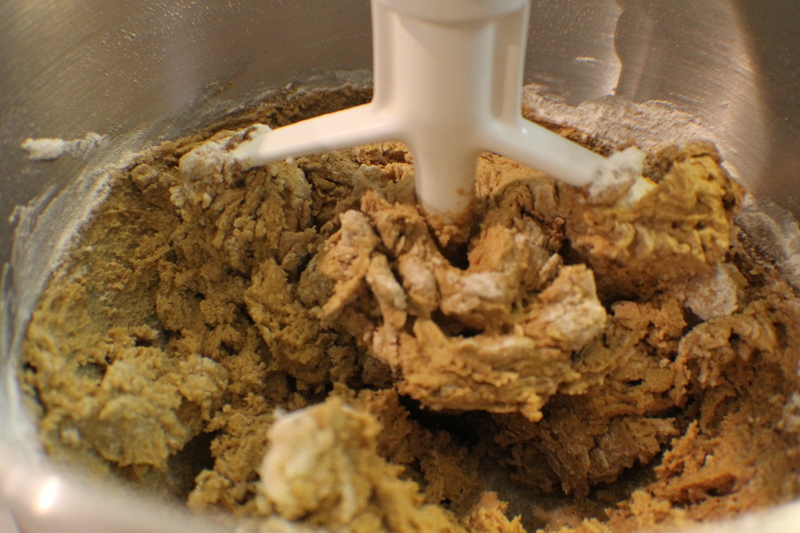 Many times, through many recipes, oatmeal cookies tend to be overly dry, or overly soft & doughy. 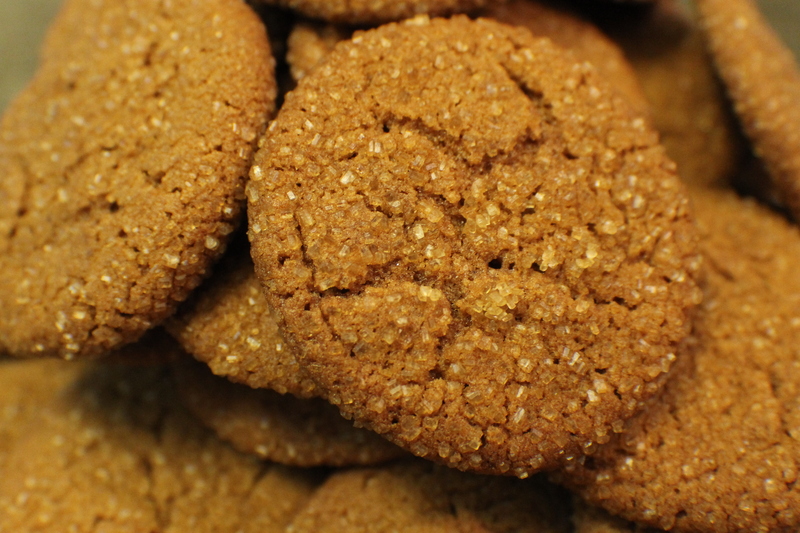 Not much flavor is another negative in the oatmeal cookie column. And no amount of added chocolate chips or dried fruit will fix it. 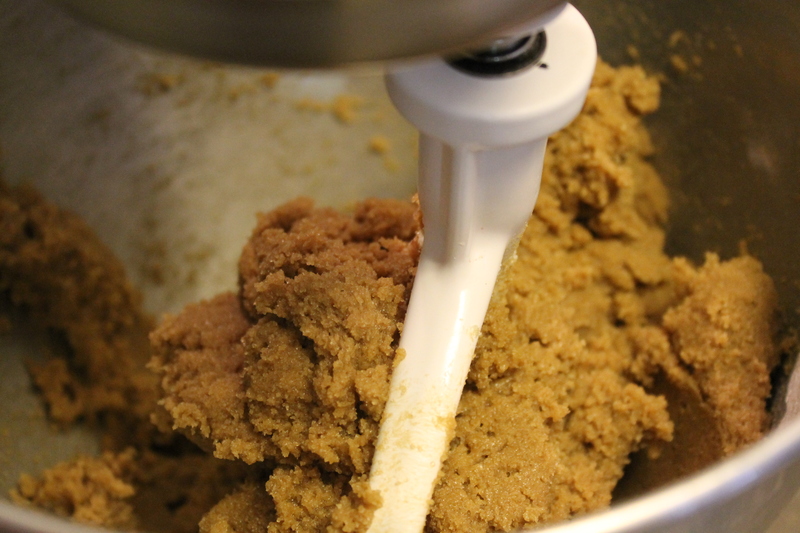 In my quest to come up with a good oatmeal cookie (because, yes, I do like them; always have), I made many batches, researched recipes old and new, and ate more cookies than I care to admit. I even made my husband take them to work to use his co-workers as tasters. 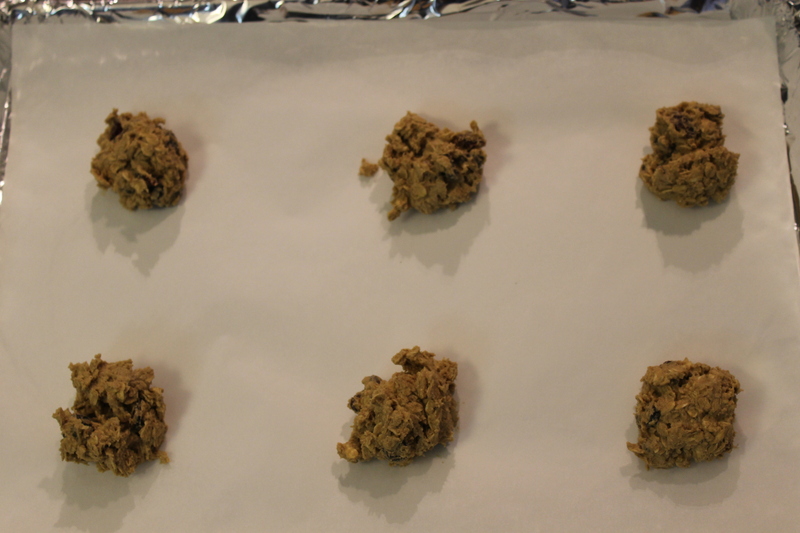 I finally hit upon the idea of making the cookies with dark brown sugar, adding some oat flour, and a little maple syrup for flavor. It just made a wonderful combination. Oh. 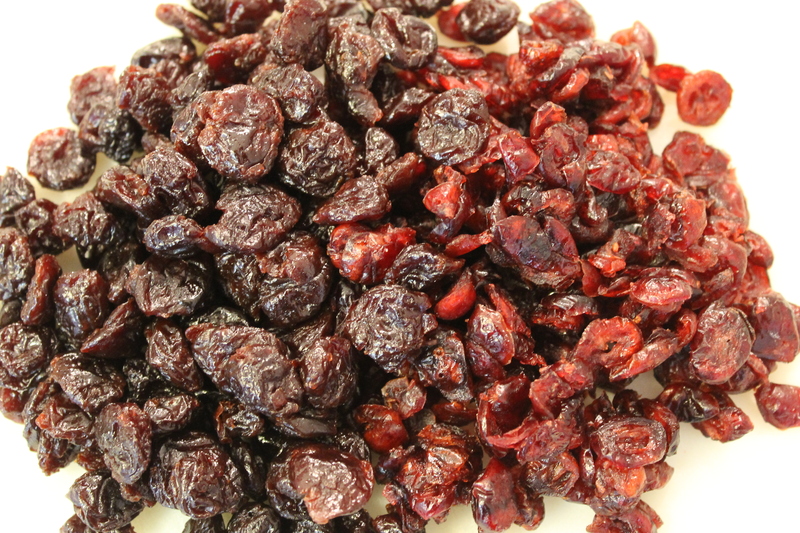 And as for the dried fruit – I use dried cherries and cranberries. They are my two favorite dried fruits and I simply like the way they go together. 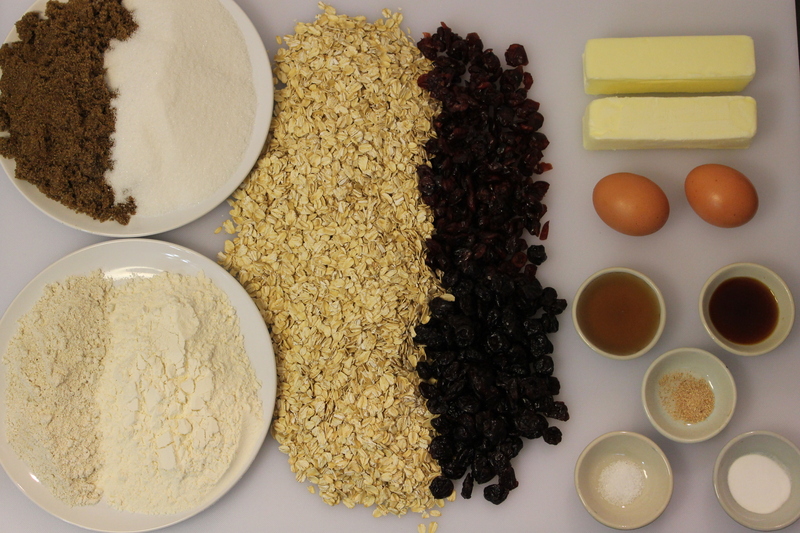 However, you can use any dried fruit you like: apricots, apples, blueberries, and, yes, raisins. 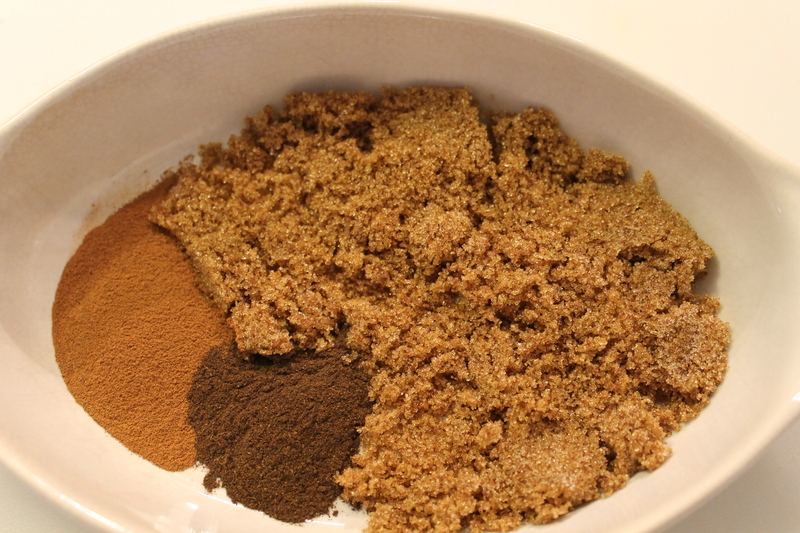 You can also use chocolate, white, or cinnamon chips as well. If you want to. Now, admittedly, I tend to make these cookies rather large. That’s because making cookies is not one of my favorite things to do. I simply don’t have the patience for it. 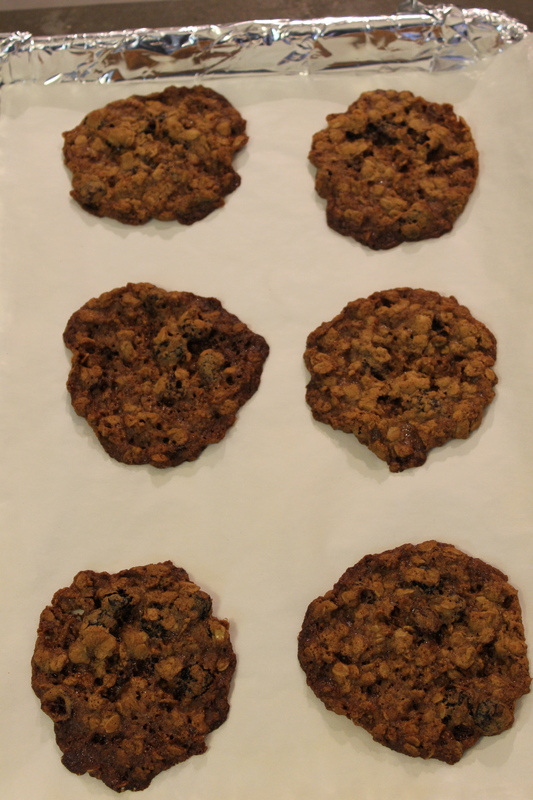 I tend to only bake cookies during the holidays – these included. You can make them any size you like. 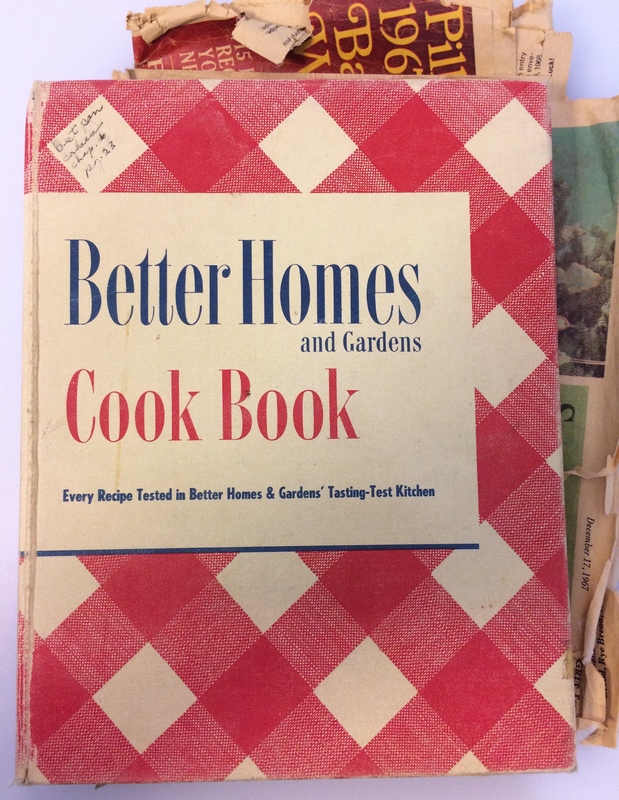 But, I will say this recipe makes a lot of cookies. 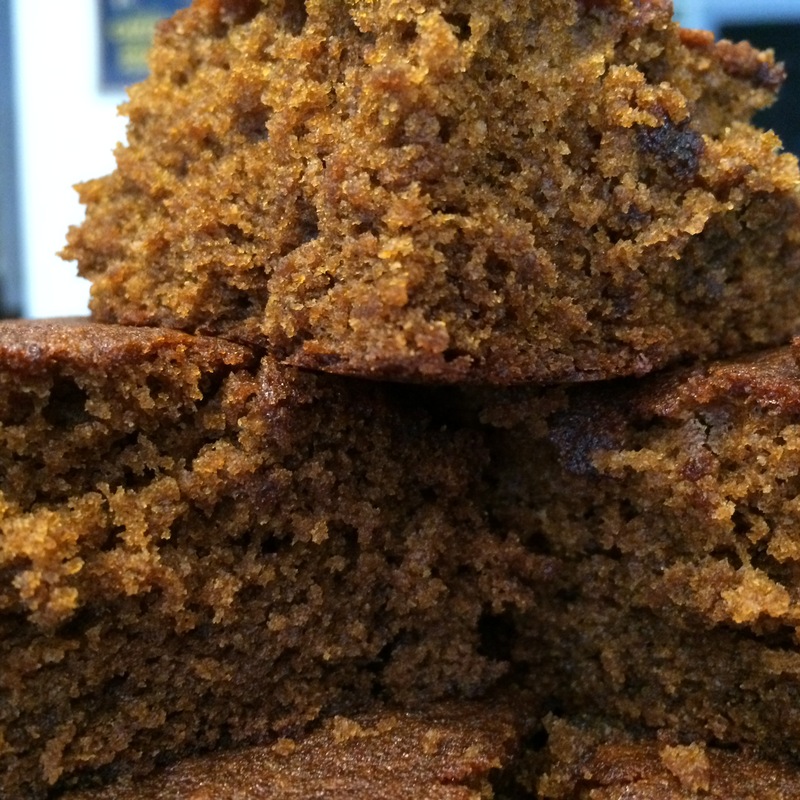 With the larger size that I bake, this recipe will still make about 5 dozen. Smaller cookies? At least 6 dozen. 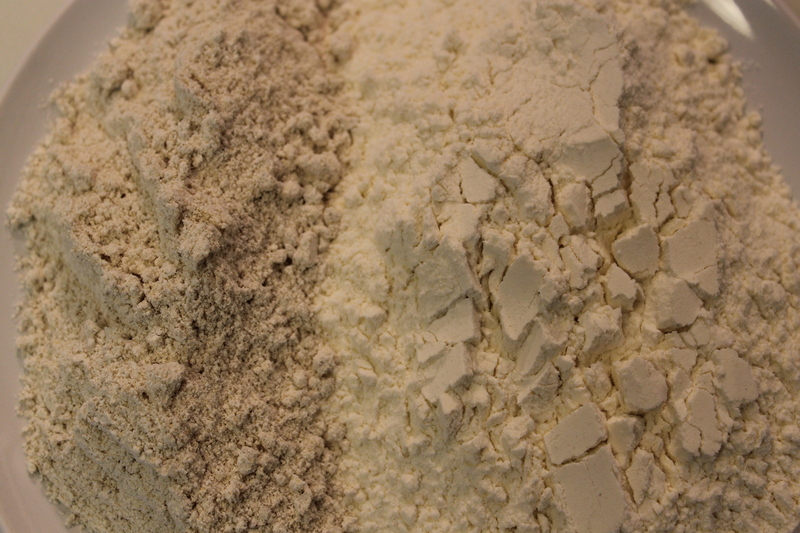 Dark brown and granulated sugars. And, of course, butter and eggs. 1. Preheat your oven to 350F. 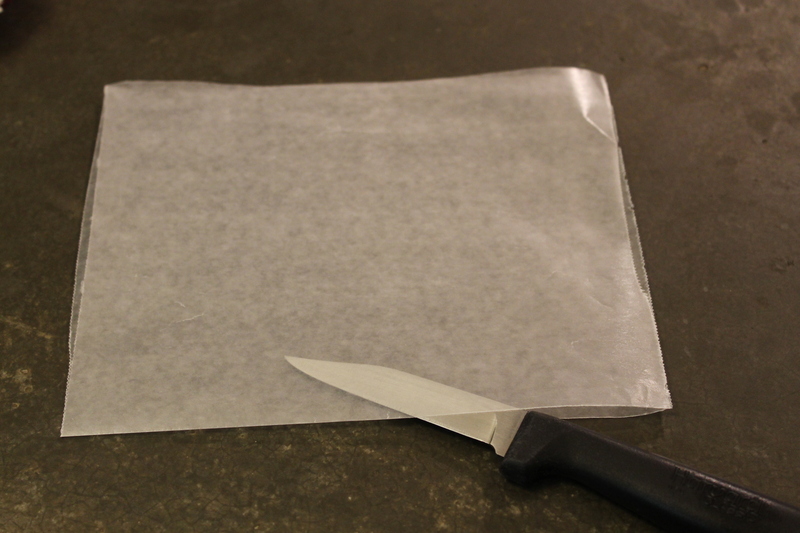 Line your baking sheets with foil and parchment paper or a silicone baking mat. Set aside. 2. 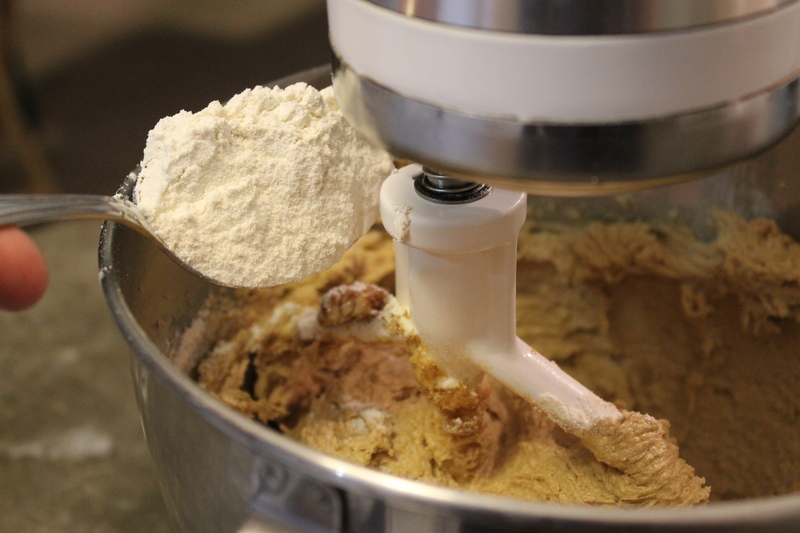 In a mixer, beat together the butter and sugars on medium speed until light and fluffy. Scrape down the sides as needed. Creaming together the butter and sugars. 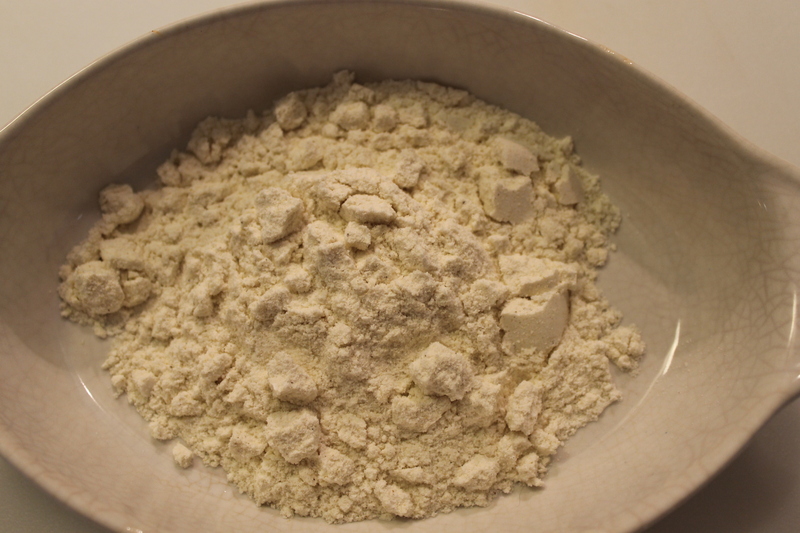 Be sure you make the mixture as fluffy and well-mixed as possible. 3. 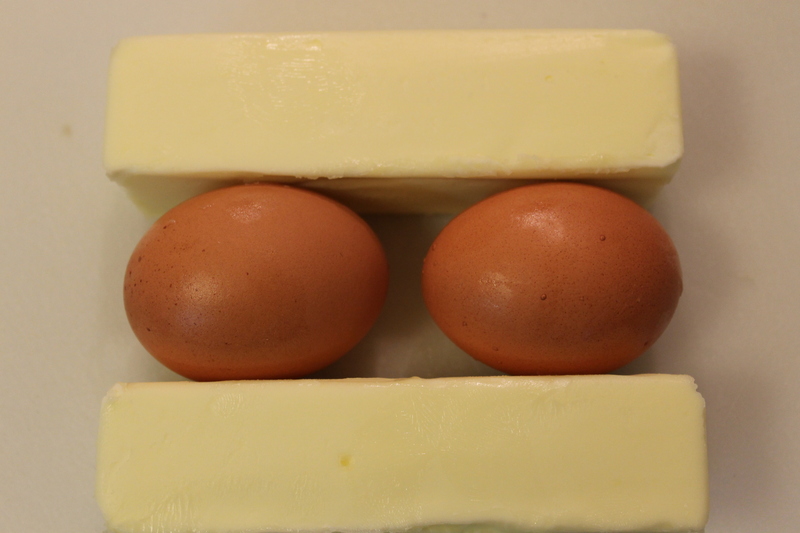 Turn down the heat to low and add the eggs one at a time, beating well after each egg. Again, scrape down the sides of the bowl as needed. Adding the eggs. 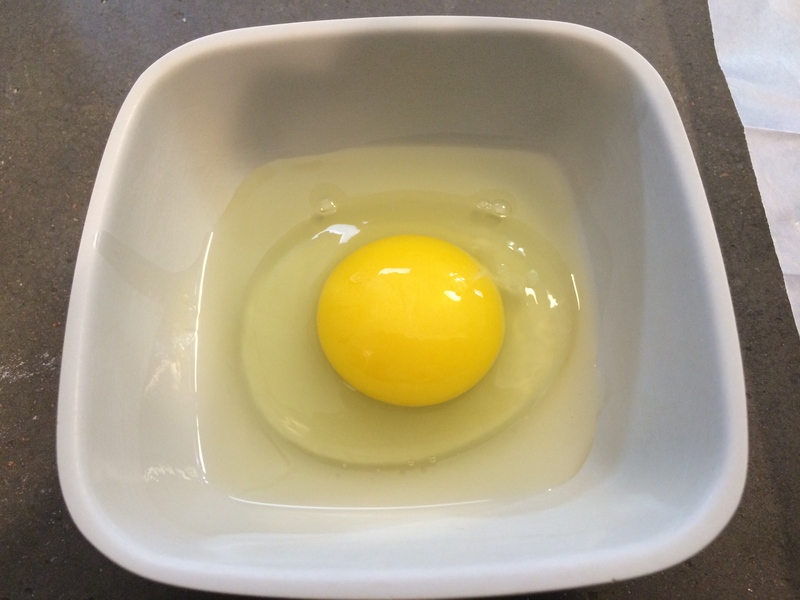 Be sure you mix in each egg thoroughly. 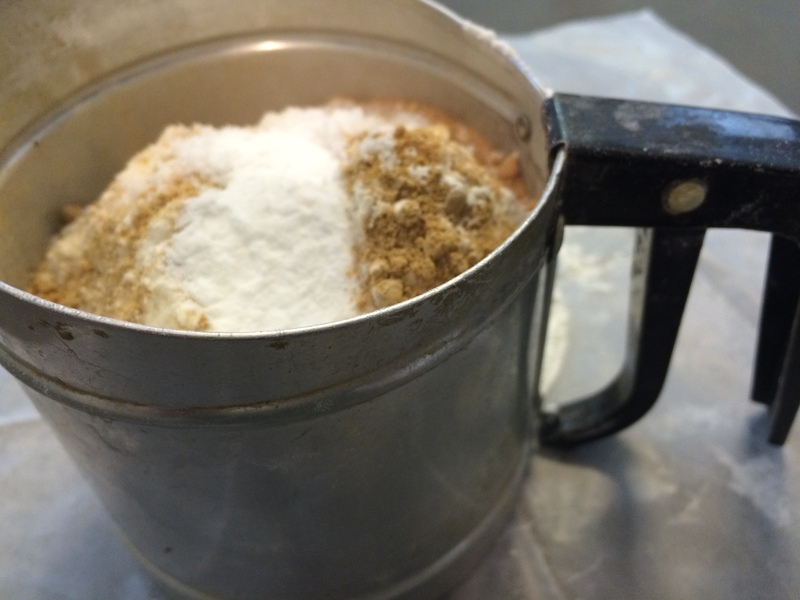 This will help to dissolve the sugar and make a homogenous mixture. 4. Add in the vanilla and syrup. 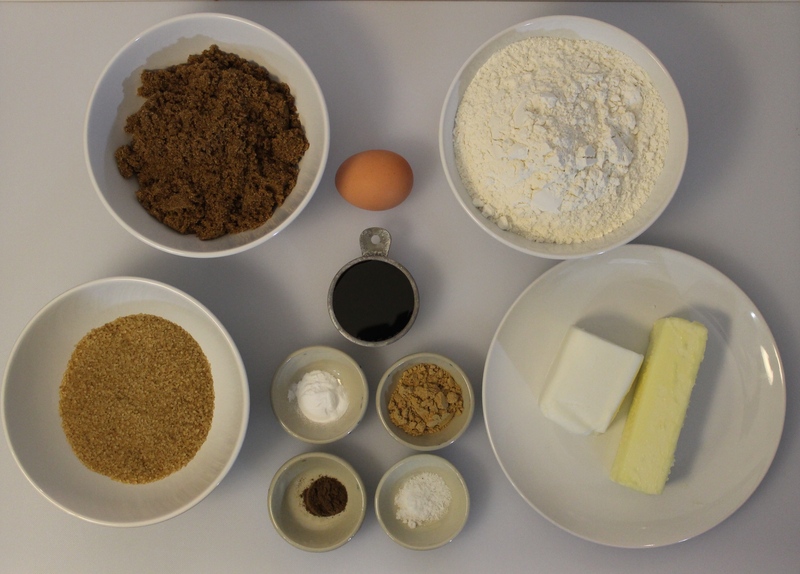 Beat on medium-low speed until all the ingredients are thoroughly combined. Adding the maple syrup and vanilla extract. 5. 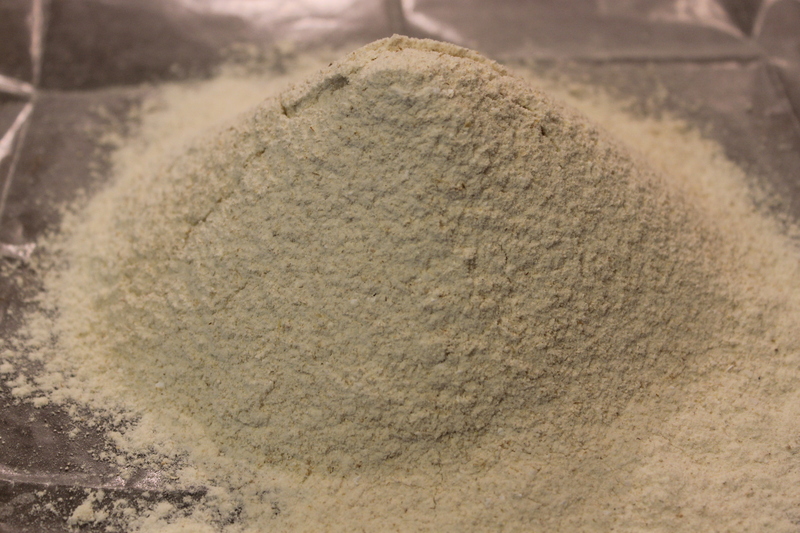 Sift together the dry ingredients – all-purpose flour, oat flour, baking soda, salt, and nutmeg. 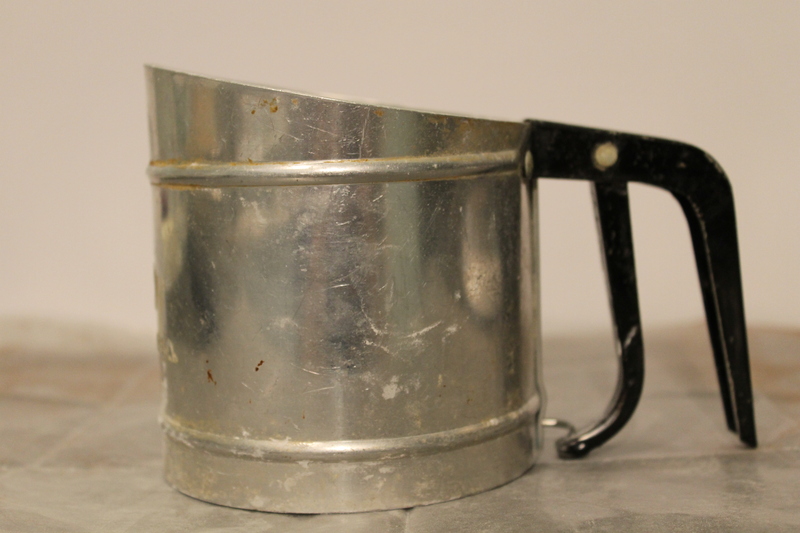 I have vivid memories of my mom using this sifter. She gifted it to me when my husband & I moved into our house. It’s still my favorite. 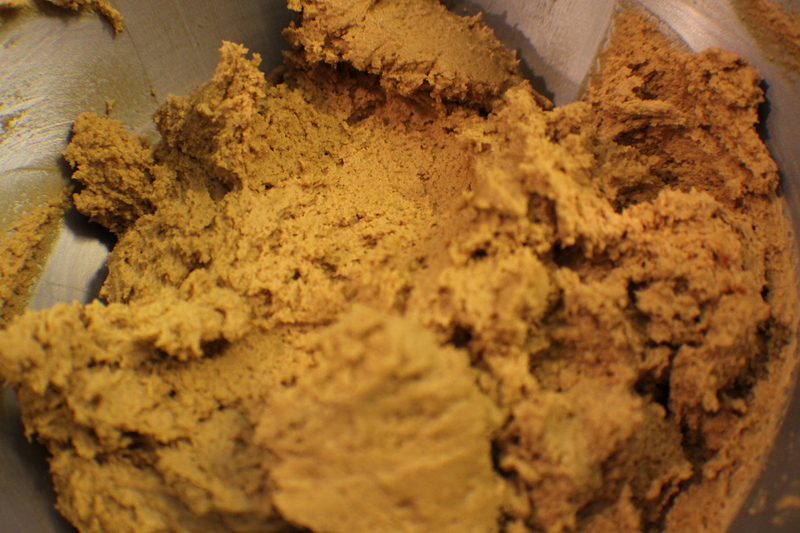 The dry ingredients ready for sifting. 6. 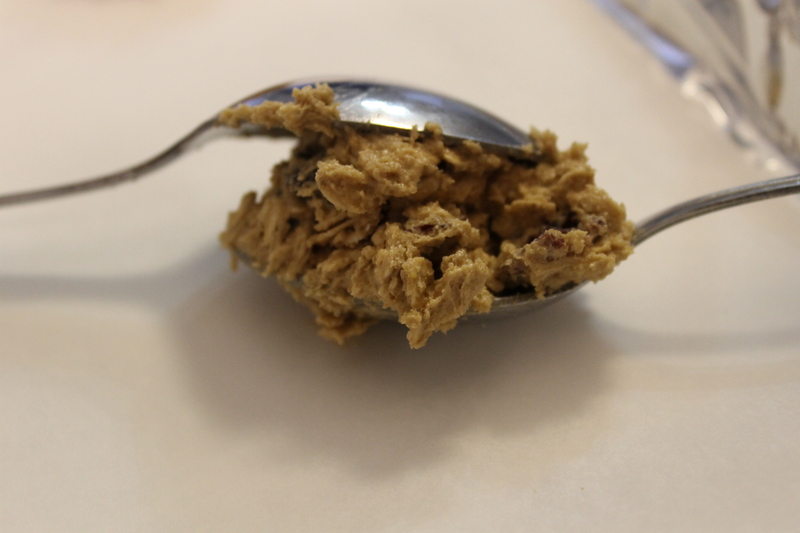 Turn the mixer to low speed and, in small scoopfuls (about 1/4 cup), add the dry ingredients, mixing well after each addition. Again, scrape down the sides of the bowl as needed. 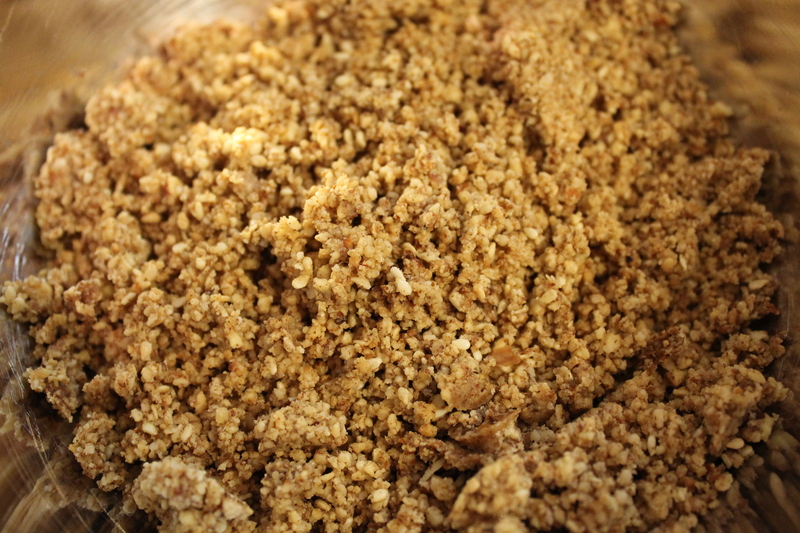 Adding the dry ingredients. You want to add about 1/4 cup at a time. This ensures complete incorporation and a whole lot less mess. 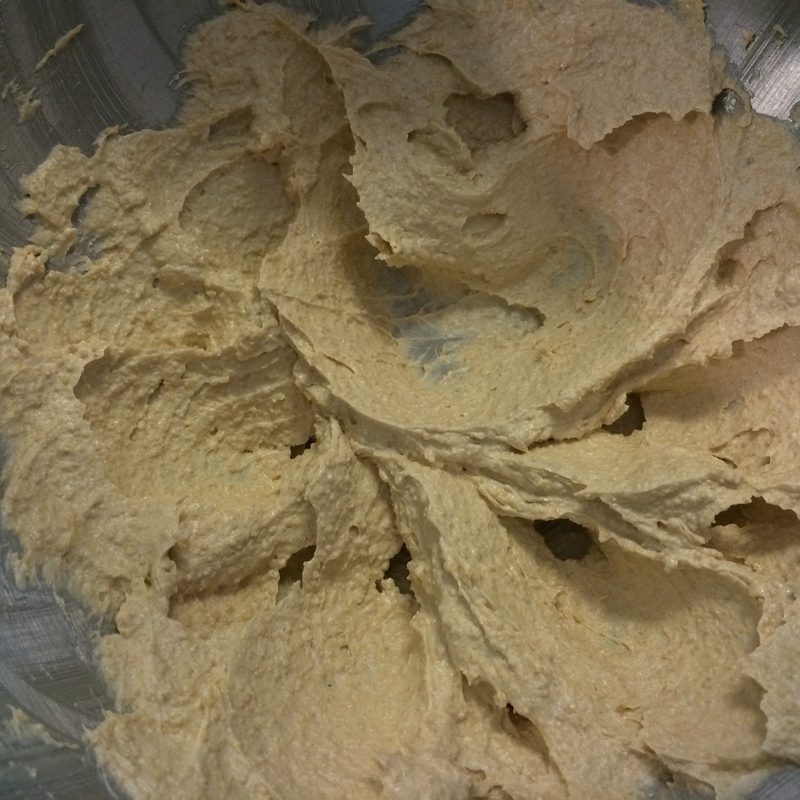 The dough after all of the dry ingredients have been mixed in. 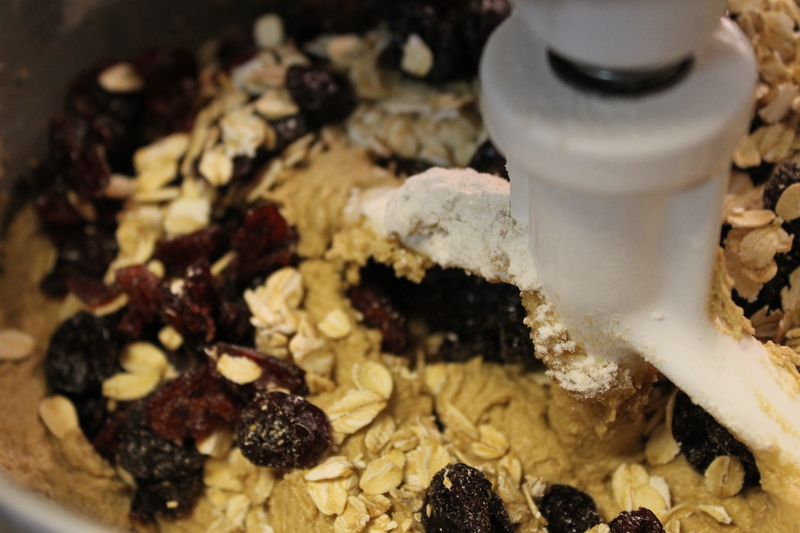 Mixing in the oats and fruit. Do this on very low speed. My mixer was quite full at this point. 8. 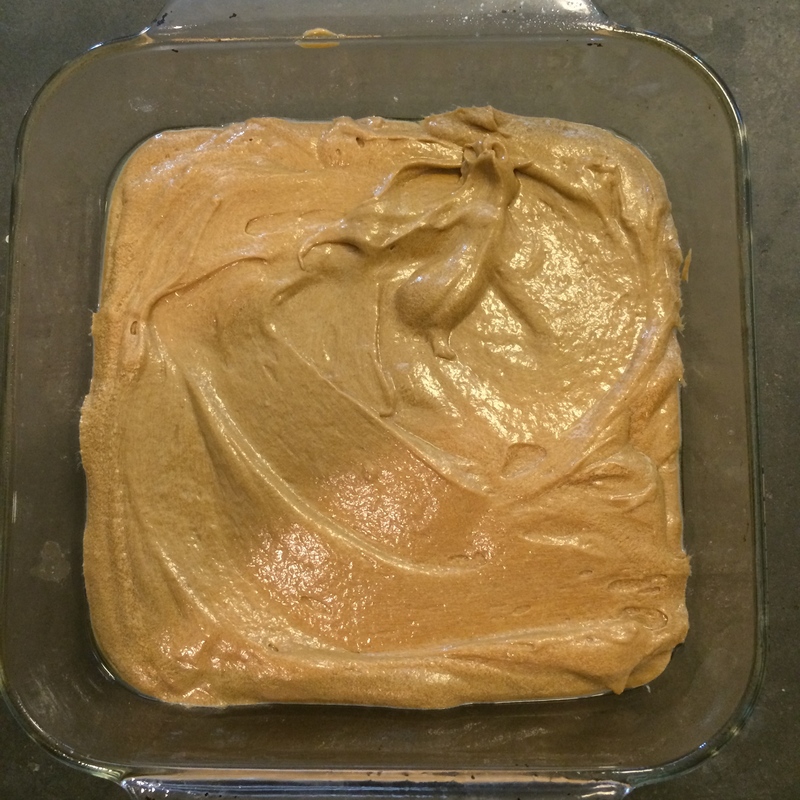 Drop tablespoons full of batter onto the baking sheets. Leave at least 2 – 3 inches in between. These cookies spread a lot. 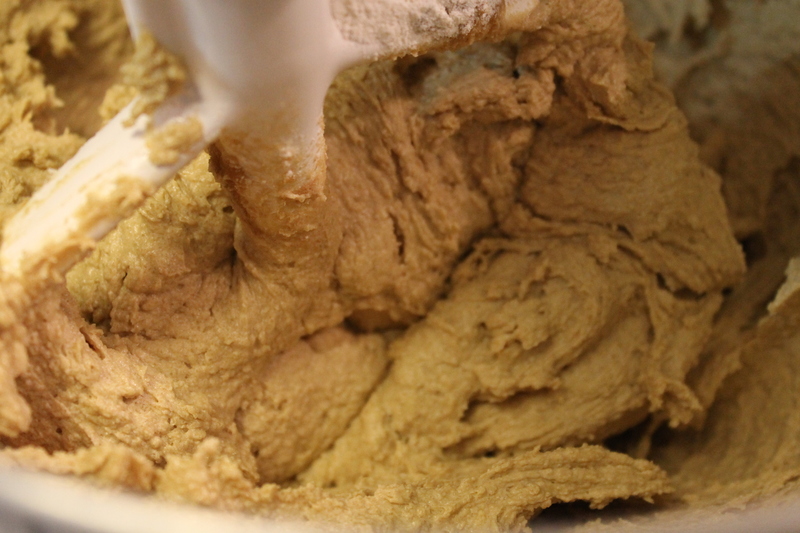 Take a nice heaping scoop of dough, smooth it off , and drop it on the baking sheet. These are soup spoons, by the way. 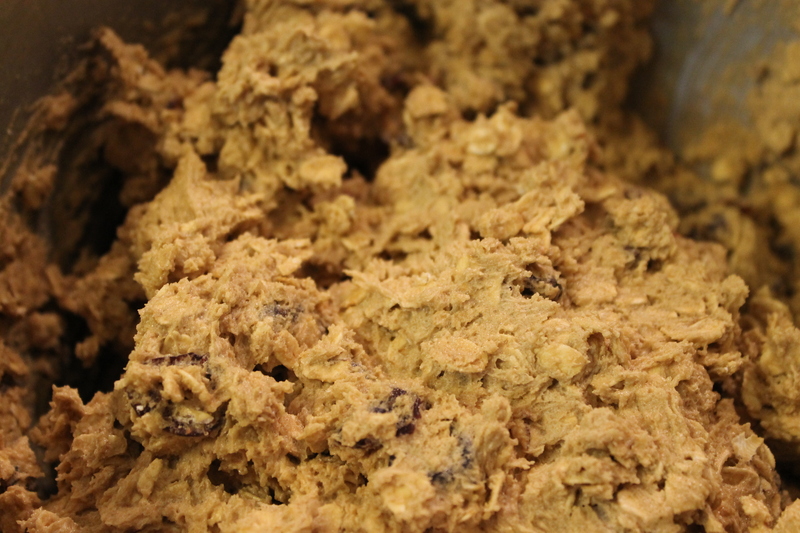 The cookies ready for the oven. These are going to spread out a lot; so, don’t crowd too many onto a sheet. This is a half sheet pan (11-1/2″ x 17″). See how much they spread? Try to resist. I dare you. Like most of us in my generation, we were raised on the good old standby, the Kraft caramel. Nothing wrong with them, really. In fact, we loved them. They came in tiny individually wrapped morsels and were only found during the holidays, starting with Halloween. Now, those were fine when we were kids. Basically, because we didn’t know any better. 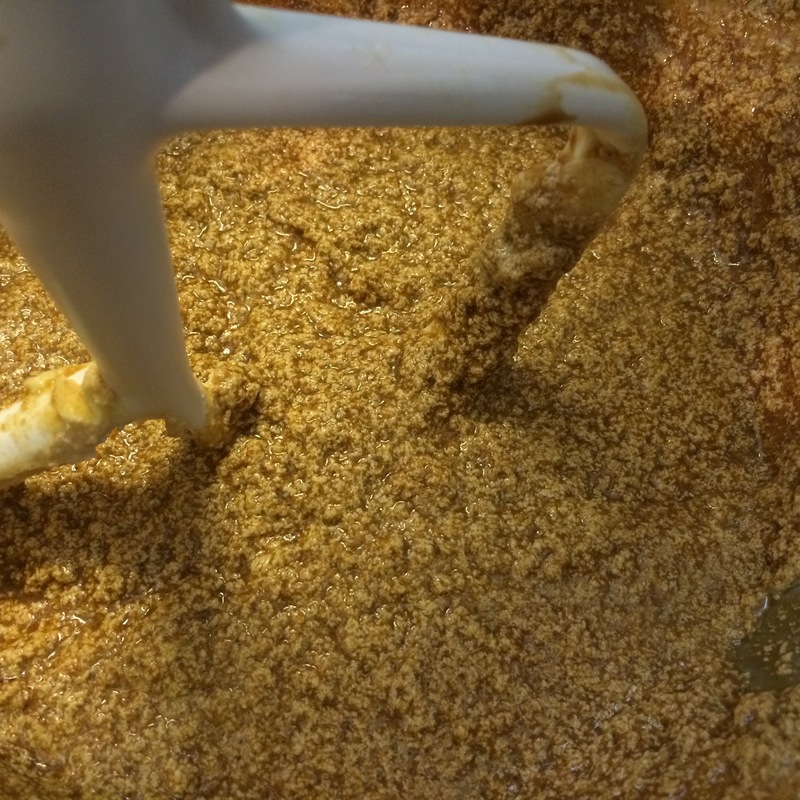 However, for me anyway, once I had my first soft, small-batch caramel, Kraft just didn’t do it for me anymore. I decided to learn how to make my own. Whatever its British or French origins, the caramel candy that appeared at the end of the nineteenth century was uniquely American. 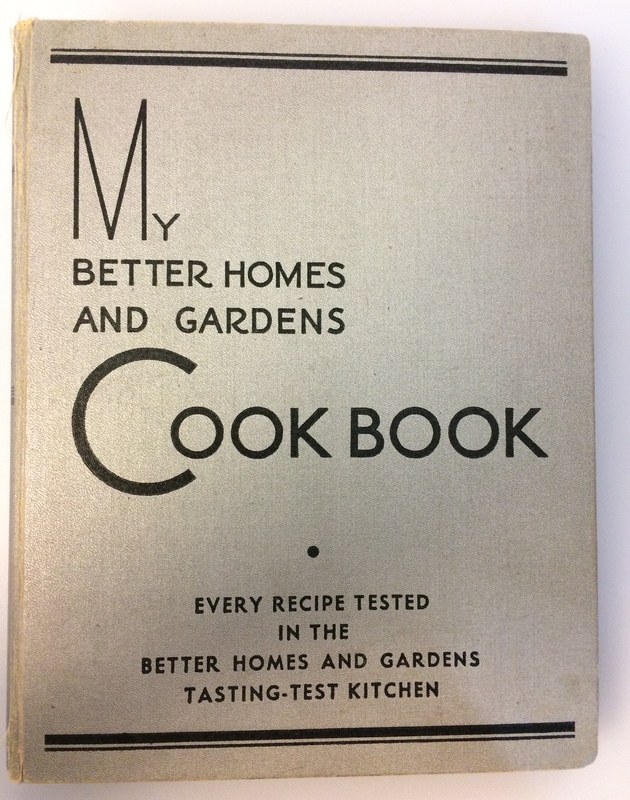 Home recipes most closely resembled the French version, employing basic combinations of butter, sugar, cream and flavorings. 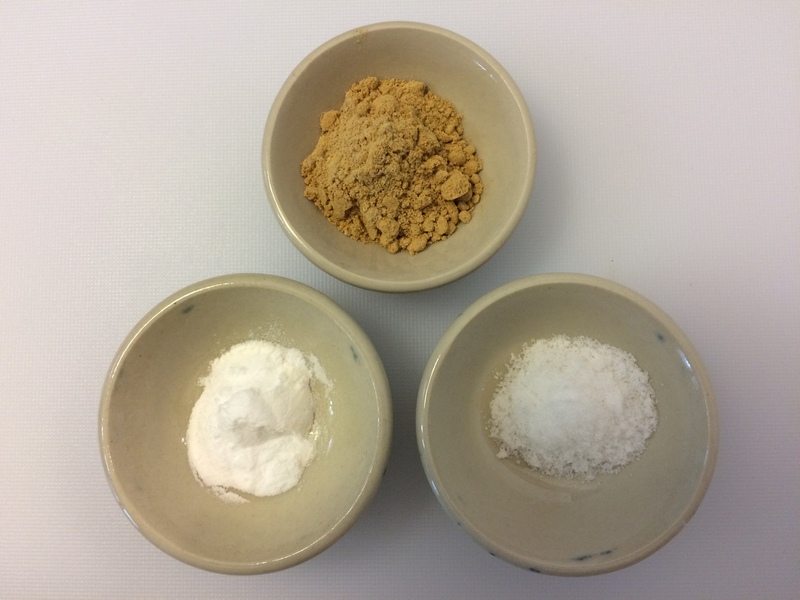 But more unique confections were spilling out of professional candy kitchens: In their quest for market share and profit, commercial producers would experiment with such ingredients as paraffin, glucose, coconut butter, flour, and molasses to alter the texture, firmness and quality of the candies. As Catherine Owen attempted to explain to her 1887 candy-making aspirants: “Caramel is really sugar boiled until it changes color, but the candy understood as ‘caramels’ is something different.” Sara Rorer’s 1889 Home Candy Making, for example, gives a recipe for “caramel” that includes only sugar and water, boiled to “the consistency of molasses.” This would be sugar cooked to a very high temperature, over 330 degrees. 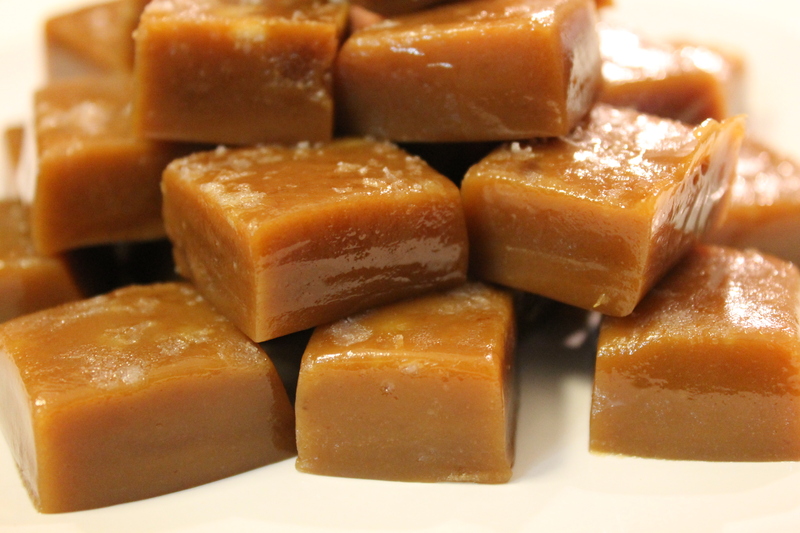 Caramel candy recipes, in contrast, cook sugar with milk or butter at lower temperatures. This is the flavor prized today as “caramel,” but for Americans in the 1880s and 1890s, that distinctive taste was not so closely attached to the caramel candy sensation. 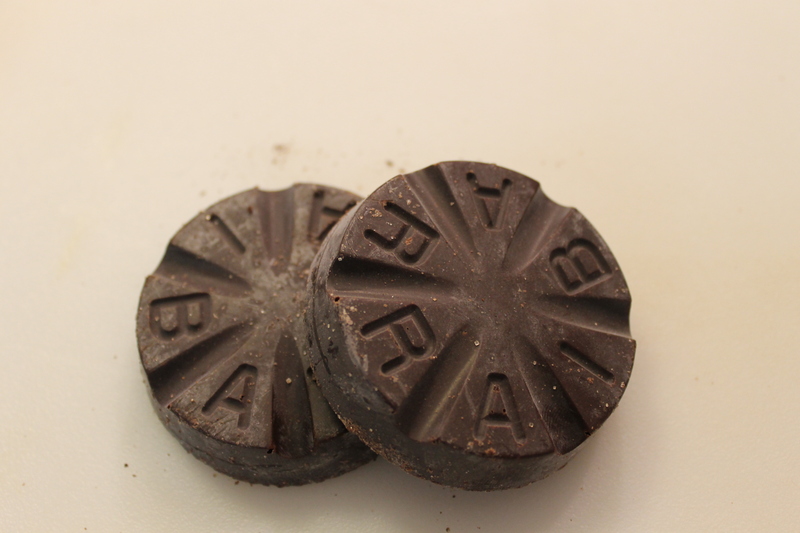 Even in caramel candy’s heyday, chocolate’s appeal and marketability were undeniable. Hence the famed Philadelphia Caramel, which was, as everybody on the eastern seaboard knew, a chewy morsel of chocolate. Candy making, for the most part, is pure common sense. 1. Don’t touch or spill the hot sugar. Especially on yourself or anyone else. 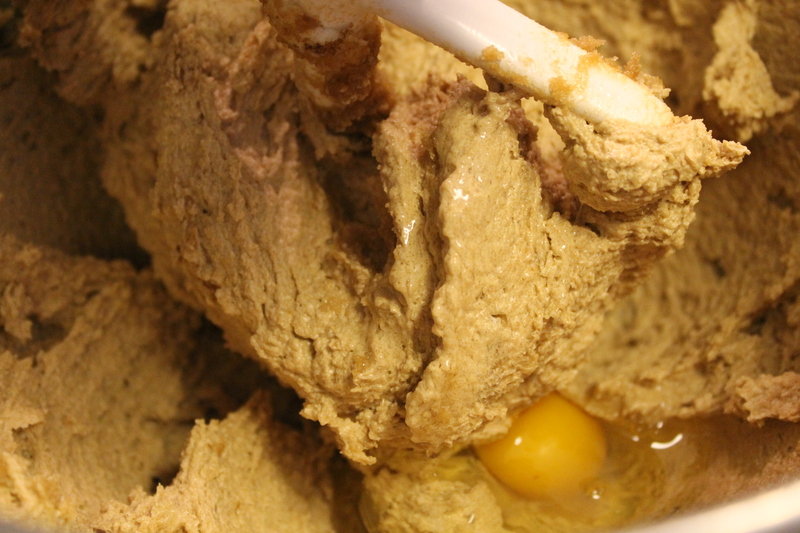 There’s a reason pastry chefs and candy makers call this stuff napalm. Have no distractions (i.e. kids, pets, alcohol, etc.) 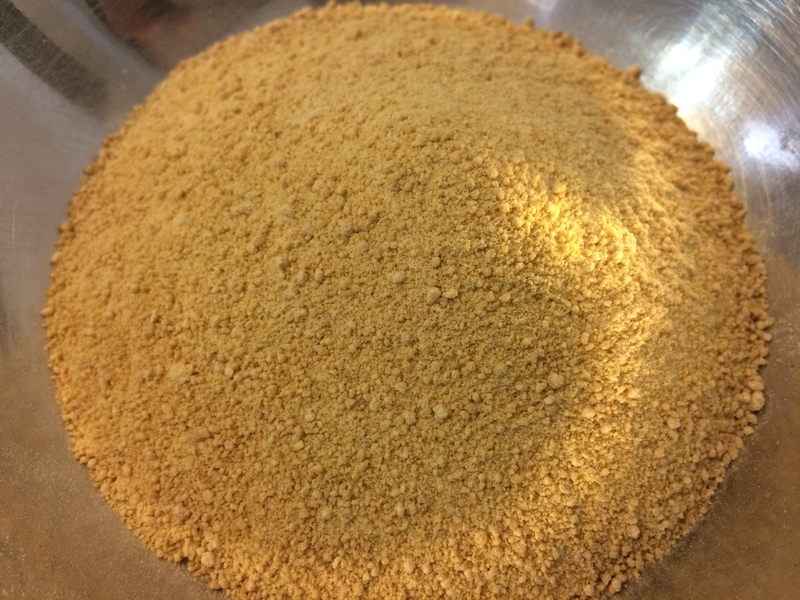 in the kitchen when you are working with molten sugar. 2. Don’t make candy on a humid day. Believe it or not, the difference between 25% and 50% humidity can affect the way the candy sets up. The wetter the day, the quicker the sugars will break down before setting up completely. 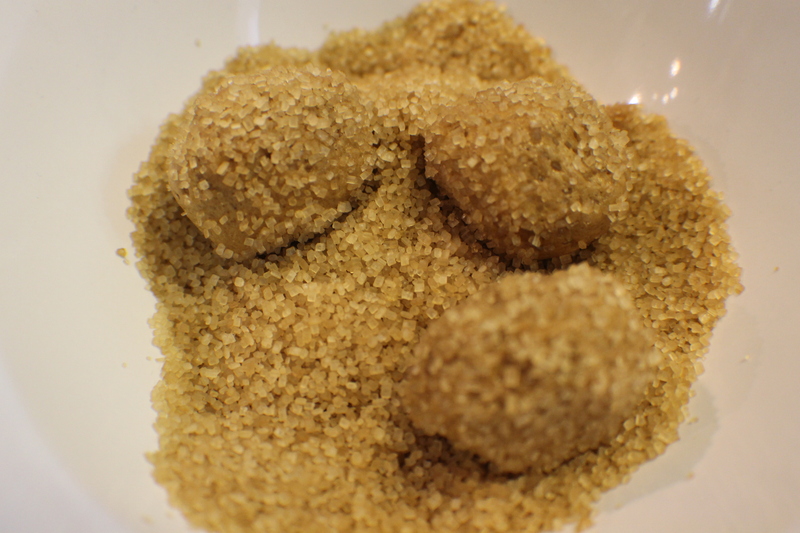 In other words, the sugar in the candy will absorb the extra moisture in the air, causing it to become a sticky mess. 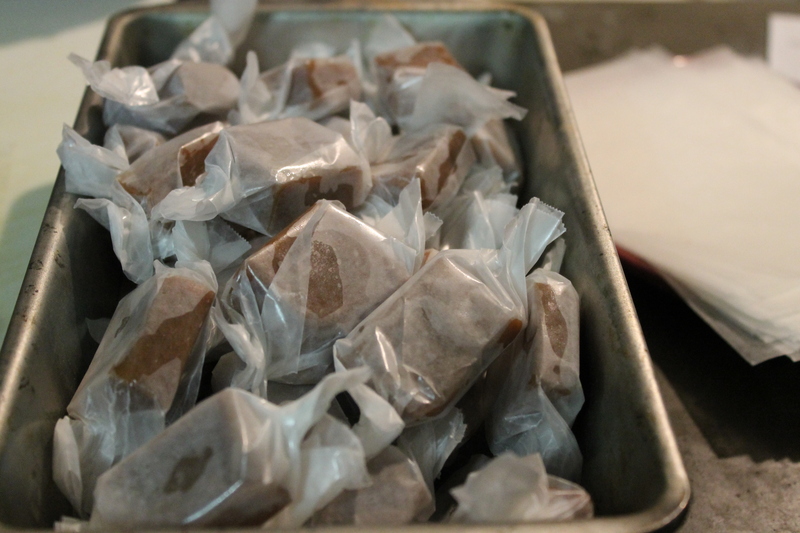 Conventional wisdom holds that candy is best made on a cold, dry day. Like, say, in Texas, February. My well-worn, well-loved candy thermometer. My thermometer is the older-style mercury type. If the bulb on this breaks, because mercury is, well, poisonous, I’ll not only have to throw away the thermometer and what I am making, but the saucepan as well. The newer thermometers are made with alcohol that’s been dyed red. These aren’t as dangerous if the bulb breaks. You can at least clean out the saucepan and use it again. These should go from tempering chocolate (90F) up to roughly 400F. 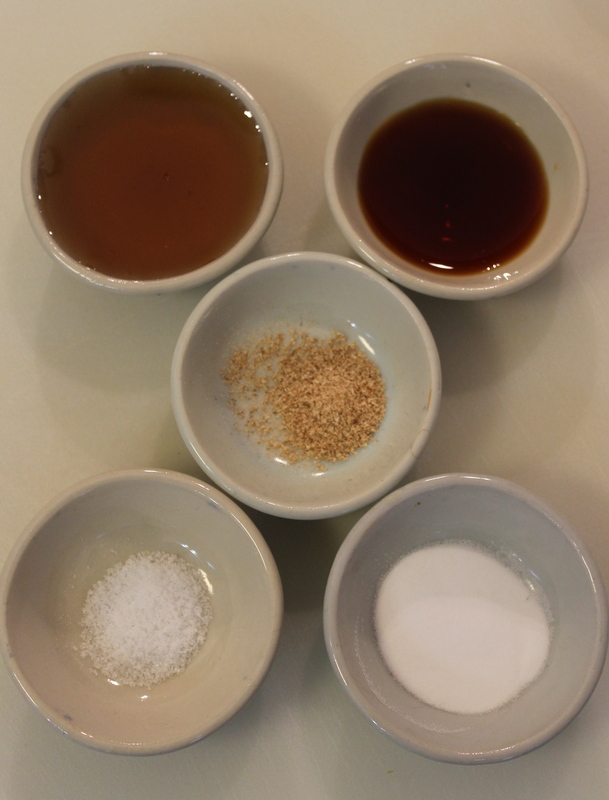 A good candy thermometer will also be labeled with the stages of cooking sugar (thread, soft ball, firm ball, hard ball, soft crack, hard crack). 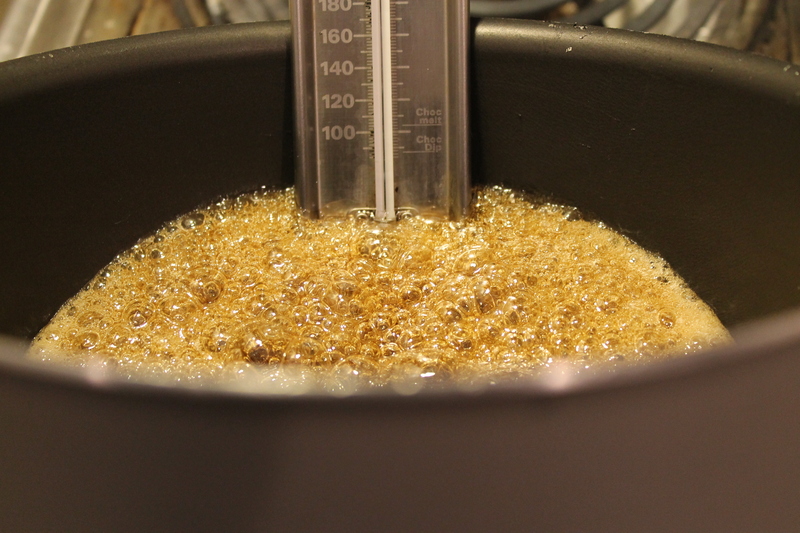 Also, most good candy thermometers can also be used for deep-frying as well. 4. Don’t let the bulb on your thermometer touch the bottom of the saucepan. 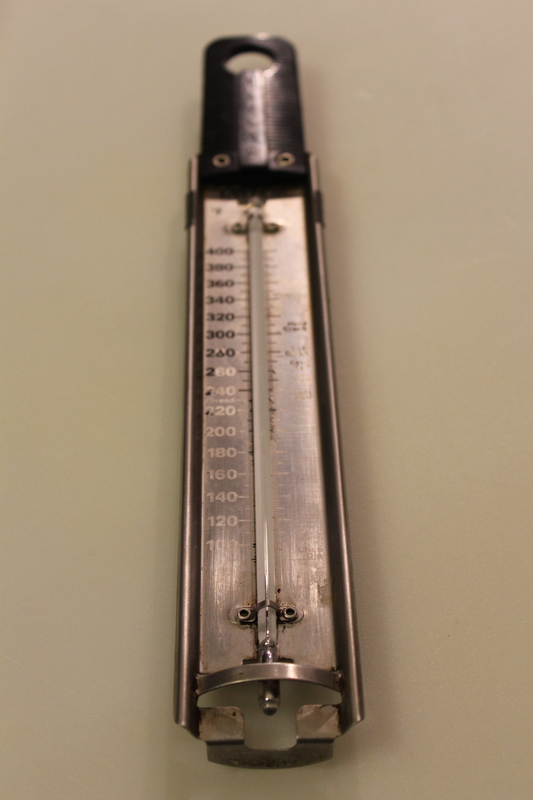 (The better thermometers have the bulb about 1/4″ to 1/2″ from the bottom). Otherwise, you could get a false reading. 5. Use the right sized saucepan for what you’re making. Too large and the sugar will cook too quickly and burn. Too small and the sugar will boil over and burn not only the stove, but you. Also, invest in some heavy-bottomed saucepans. Flimsy, thin saucepans (or any cookware) are no good for anything, but especially bad for candy making. 6. Read the recipe carefully and thoroughly before starting. Have everything ready to go. Your ingredients should be measured, your utensils ready to go, your pans prepared, and a clear path made. 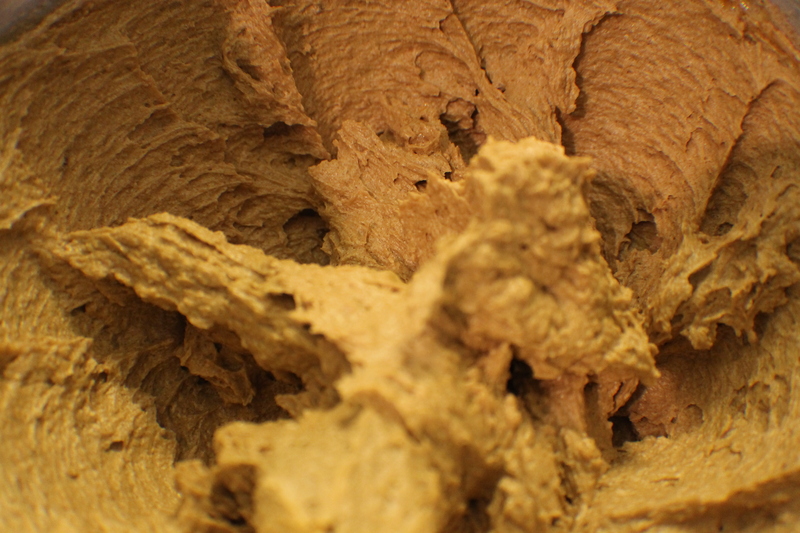 There is a lot of “hurry up and wait” in candy making; but when things start to happen, they happen fast. Pre-preparation is essential. 7. Watch for crystallization. 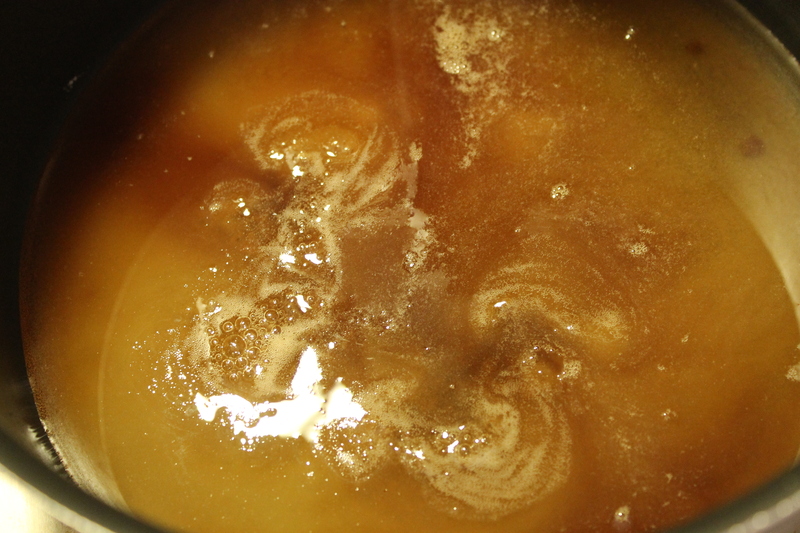 This happens when the liquid in the saucepan can no longer absorb the sugar. 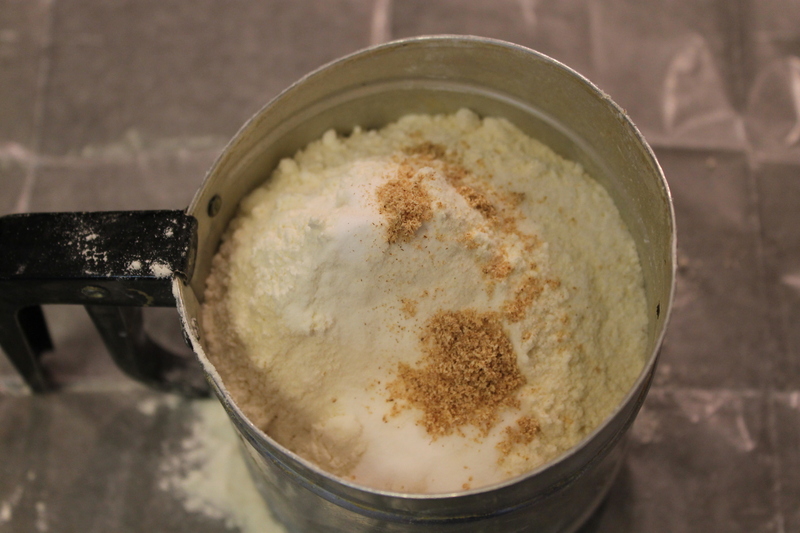 You end up with just a big cake of sugar in the saucepan. There’s no fixing this. If it happens, you have to start over. 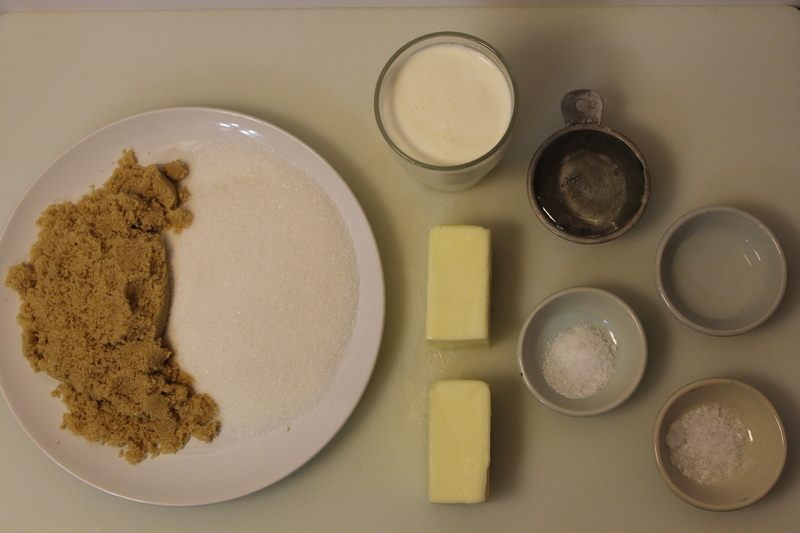 The best way I’ve found to combat this is to simply make sure all of the sugar is moistened before I start to cook it. I just gently push the sugar down and around in the liquid (usually water and corn syrup) until it is completely moistened. 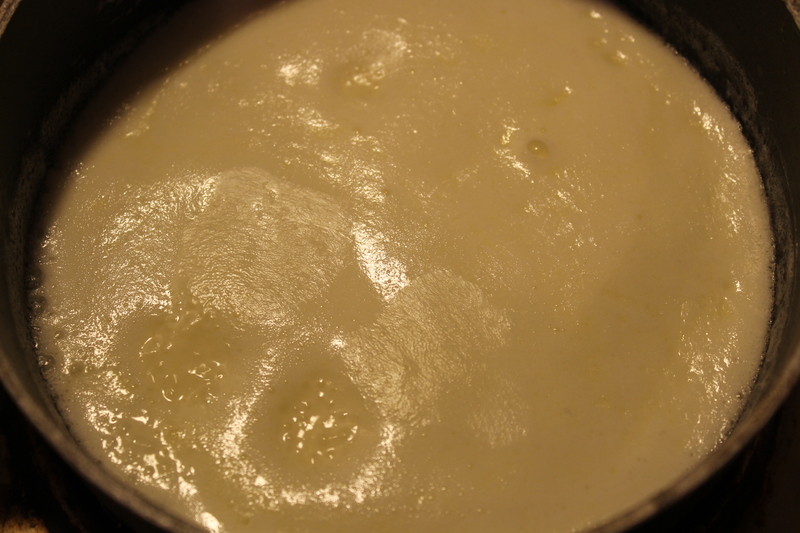 Then, I put the saucepan over medium-low heat and let it cook without stirring the mixture. I let the sugars dissolve on their own. 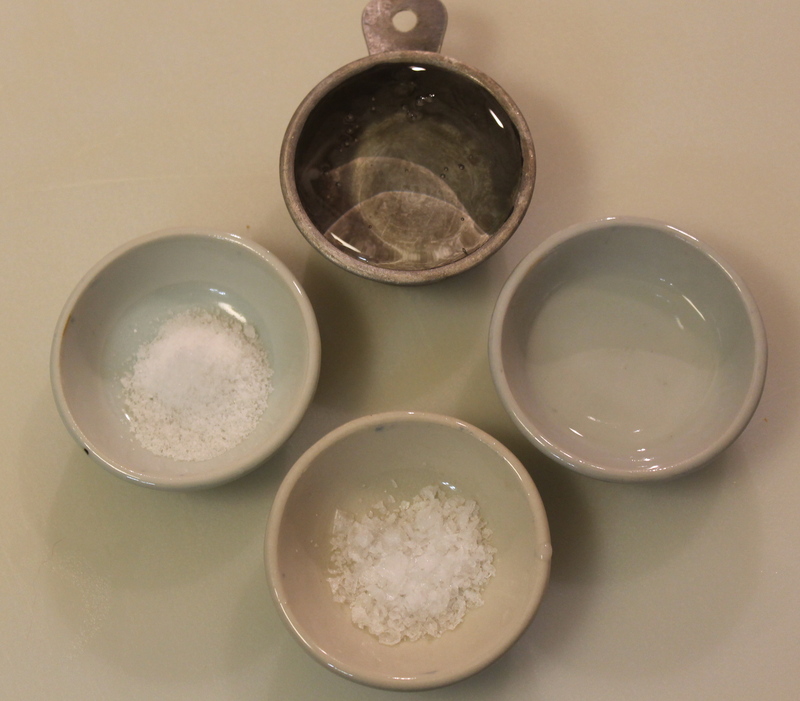 The more you agitate the mixture, the more likely you’ll get crystallization. So, fight every instinct you have and DON’T STIR. If you do happen to get some sugar crystals on the side of the saucepan, take a pastry brush, dip it some water, and brush the sides of the saucepan to dissolve the sugar. If there are any solid, un-moistened crystals, they can also cause crystallization. 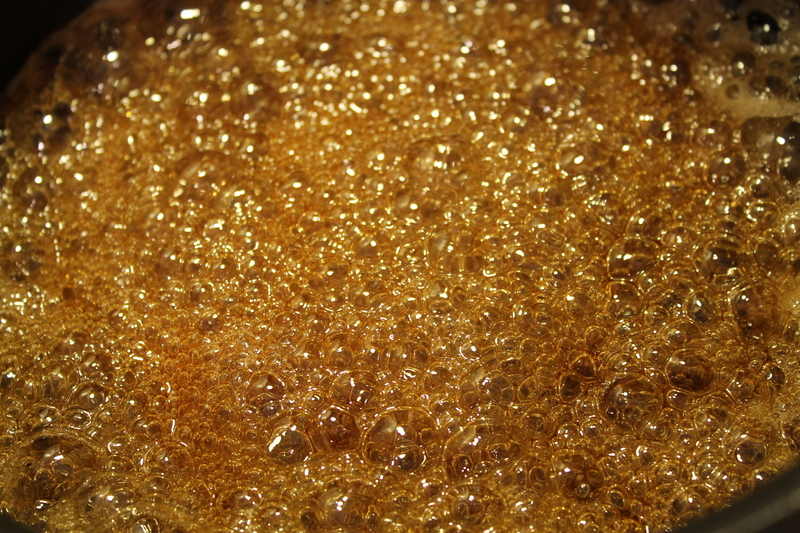 Once the sugar comes to a boil and all of the sugar has dissolved, you can, carefully, stir to your heart’s content. The danger for crystallization has passed. 8. Don’t cook the sugar too fast. Medium-low to medium heat is ideal. 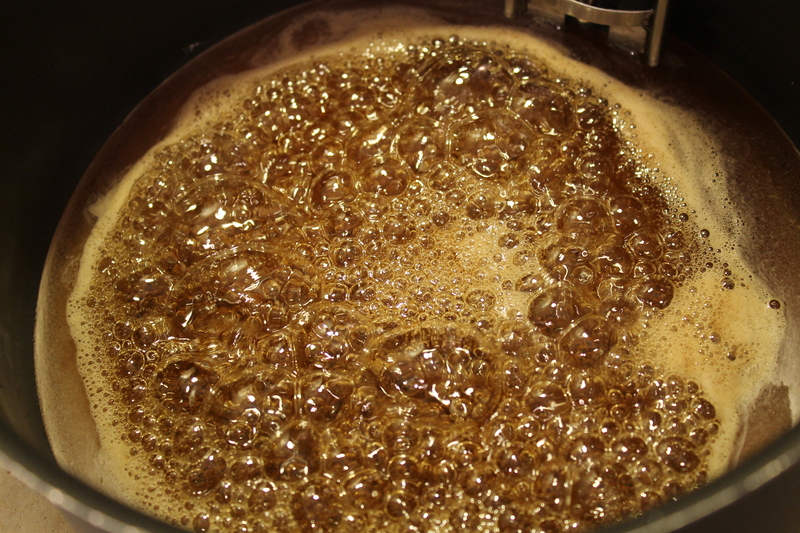 You want to give the sugar time to dissolve and the moisture to begin to evaporate before the mixture comes to a boil. This also gives you more ability to control the temperature and greatly reduces the risk of the sugar burning. 9. Do not double up a recipe or substitute unless you’re an experienced candy maker. 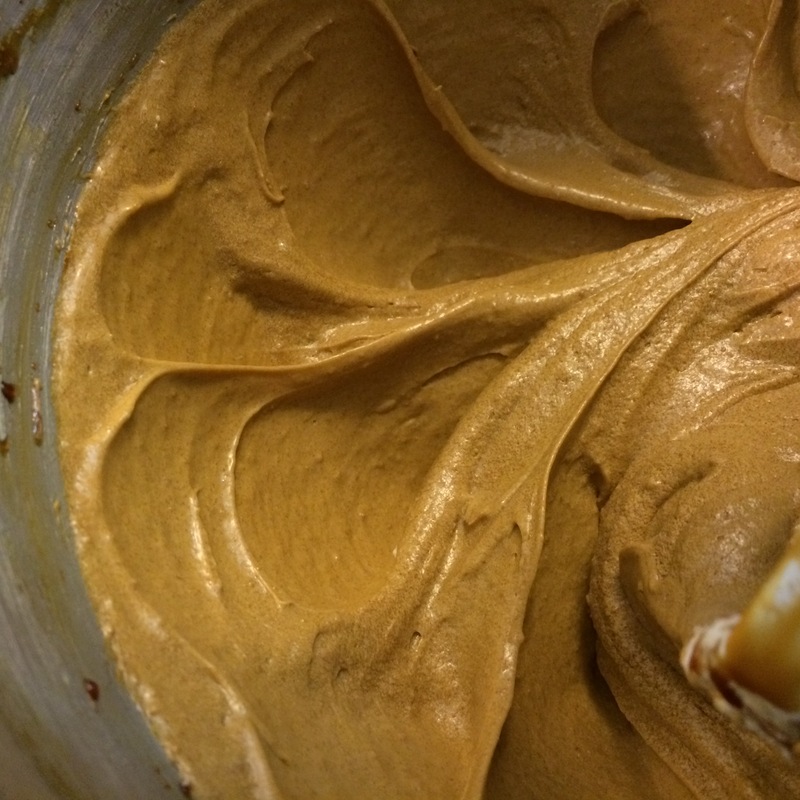 Candy recipes, along with baking recipes, are like scientific formulas. If you throw it out of balance or change an element, the whole experiment could fail. Or, be a spectacular success. 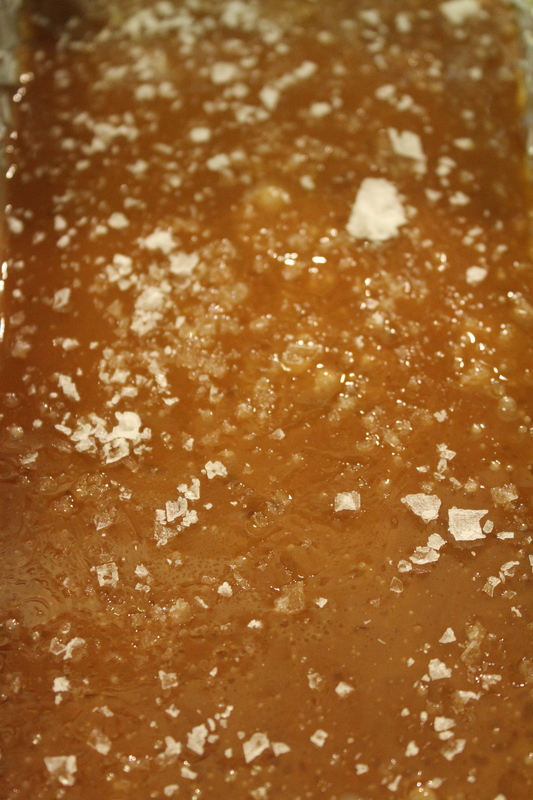 a) If you want to have unsalted caramels, simply use all unsalted butter and omit the salts. 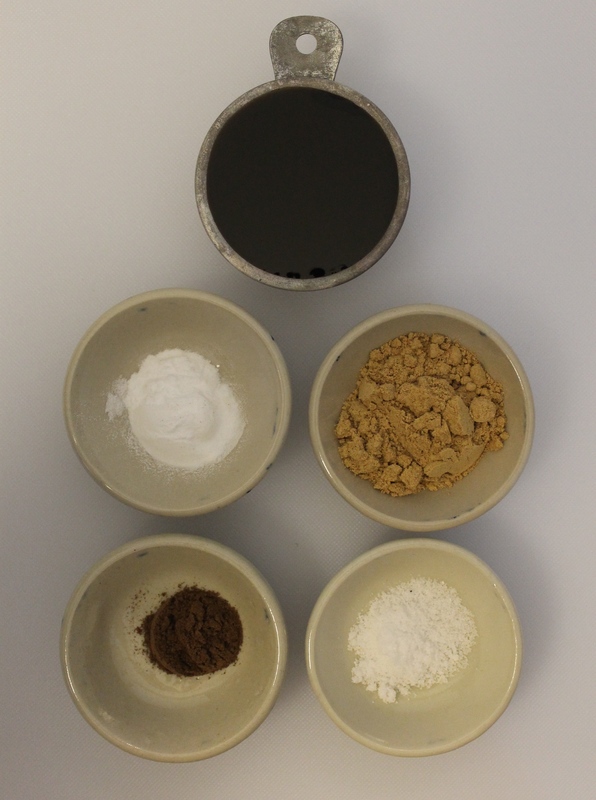 b) In this example, I use a combination of brown and white sugars. I think the flavor and color are simply better. However, if you prefer to use all white sugar, go ahead. c) I used almond extract in this example. Again, because I like the flavor. The more traditional flavoring is vanilla, so, if you have that, use it. Just make sure, either way, you’re using pure extract, not artificial flavoring. 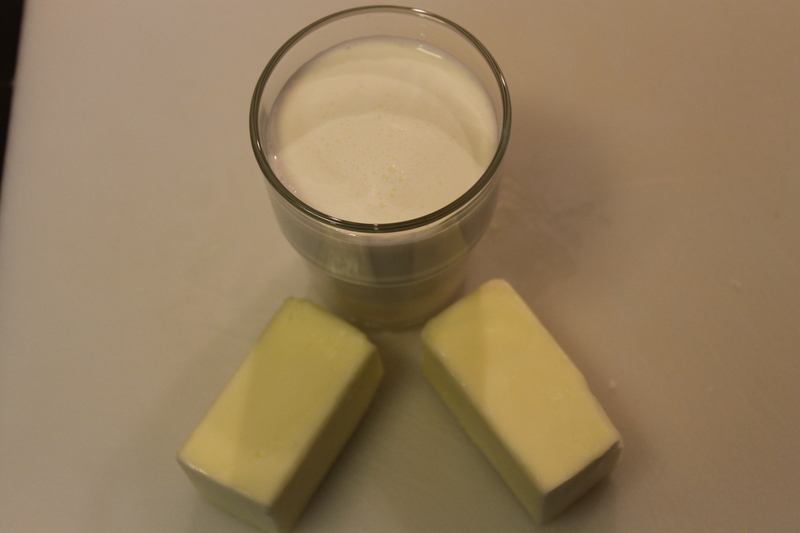 d) Use cream and butter. This is non-negotiable. 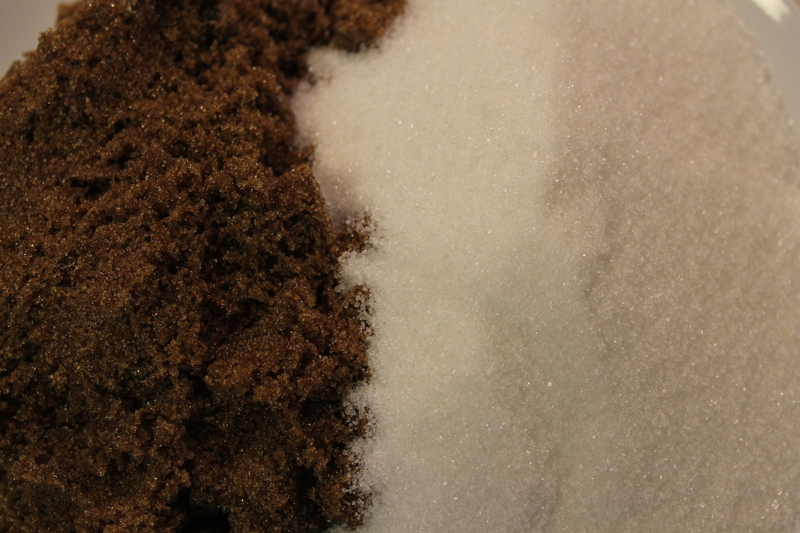 Light brown & white sugars. I like the combination. However, you can use all white sugar if you prefer. Flaked sea salt close up. I love this stuff. 1. Line 9-inch loaf pan with parchment paper or foil. Make it as smooth as you can. Make sure there are no holes in the foil or paper as you press it down. If you accidentally poke a hole or make a tear, you need a new piece. Spray or butter the paper or foil and set the pan aside. 2. 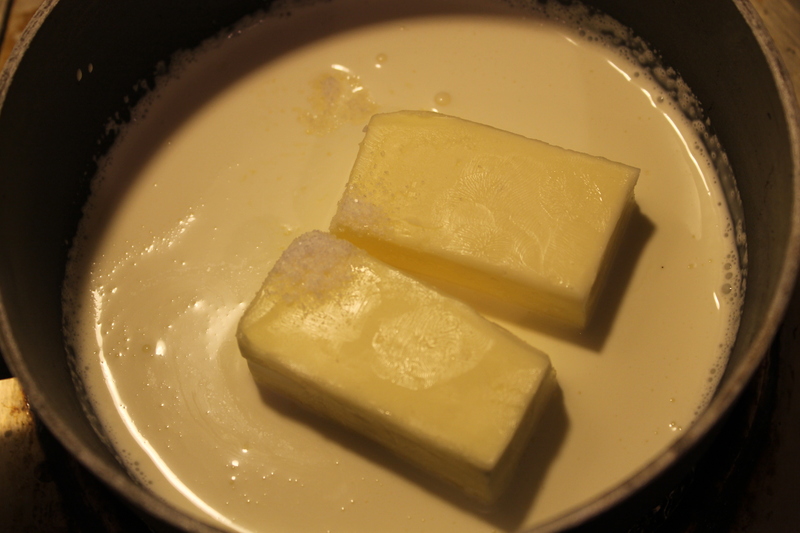 In a small saucepan, place the cream, butter, and 1/2 tsp. sea salt and bring the cream to a boil over medium heat. 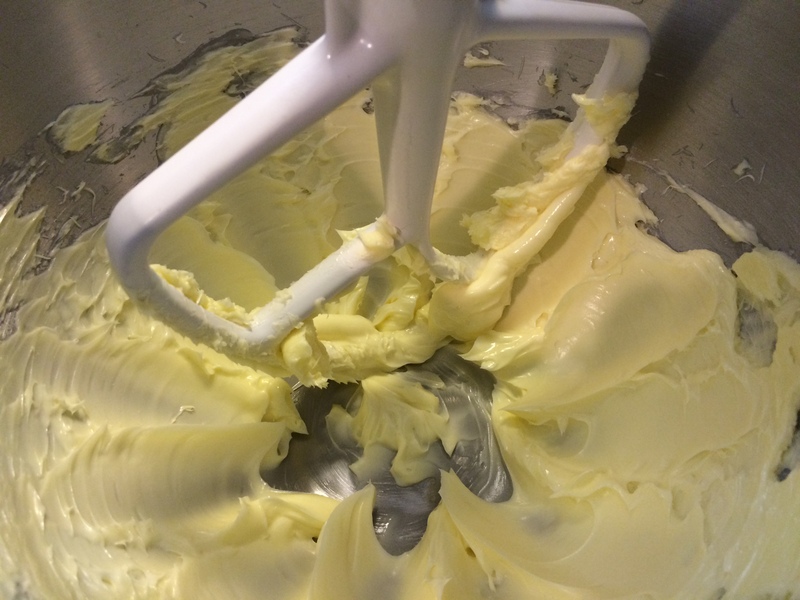 Cream, butter, and salt in the sauce pan. 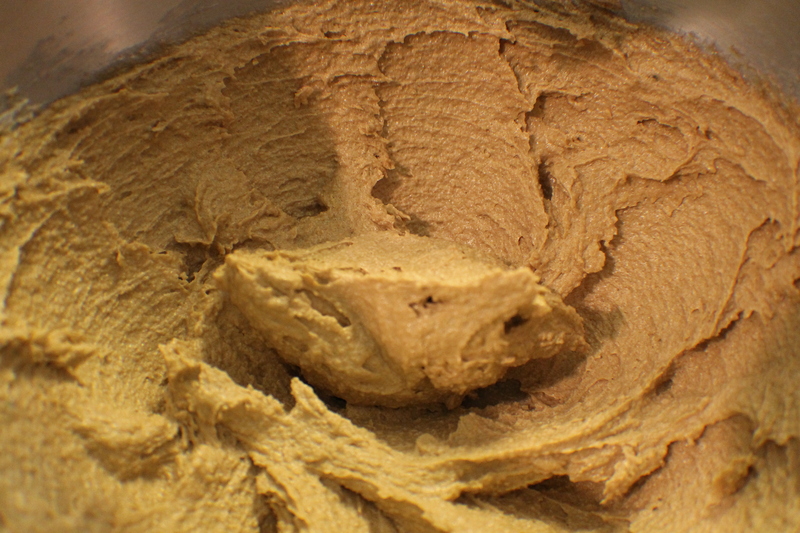 Bring the cream to a full boil before taking off the heat and adding the extract. Take the pan off the heat, add the extract, cover the saucepan and keep warm. 3. 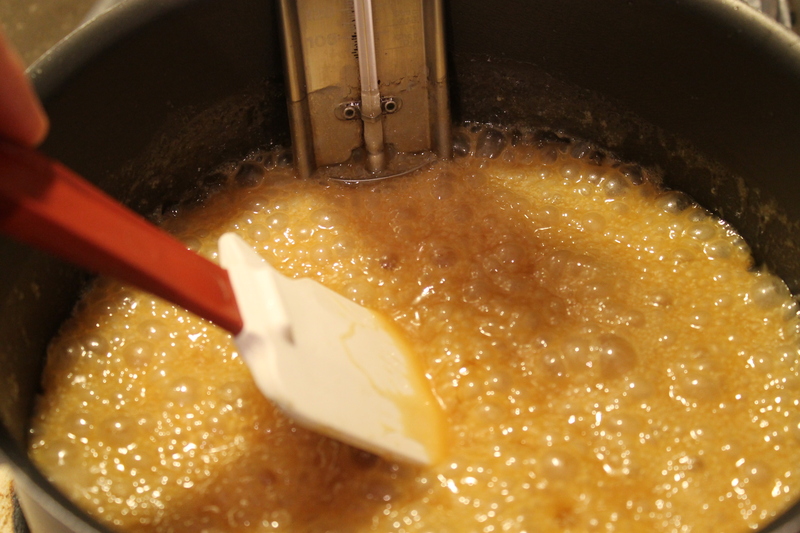 In a medium saucepan fitted with a candy thermometer, combine the sugar, corn syrup, and water. 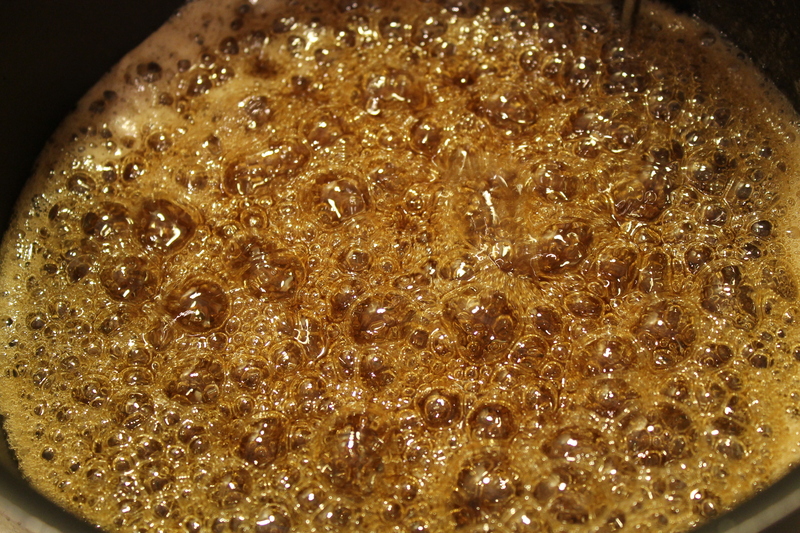 The sugars, corn syrup, and water in the saucepan. 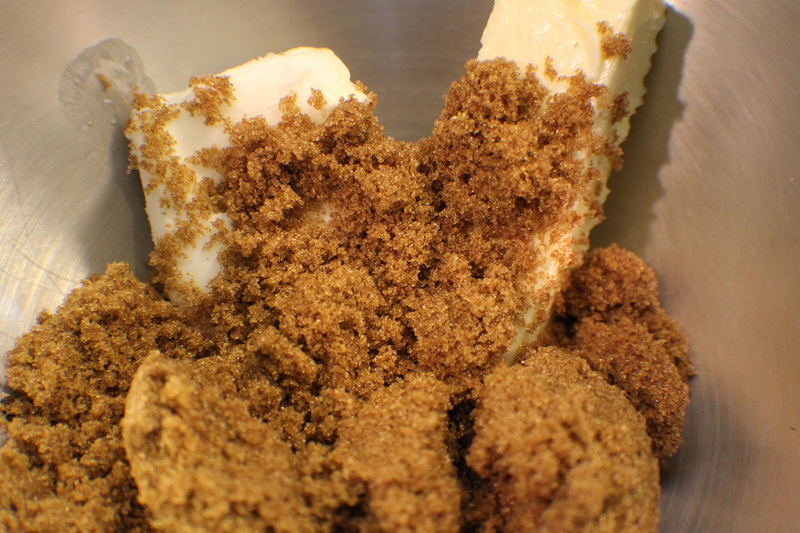 Very gently mix the ingredients so the sugars are just moistened. I basically push the sugars around until they are submerged as much as possible. After that, I leave it alone. Over medium heat, bring the mixture to a boil (don’t stir!) and cook until they syrup reaches 302F (Hard Crack). The sugars are moistened and the thermometer is attached. We’re ready to go. At 5 minutes over medium heat. There is still some undissolved sugar. Don’t stir! This is the danger point where crystallization can occur, especially if you disturb it. 10 minutes at 210F. 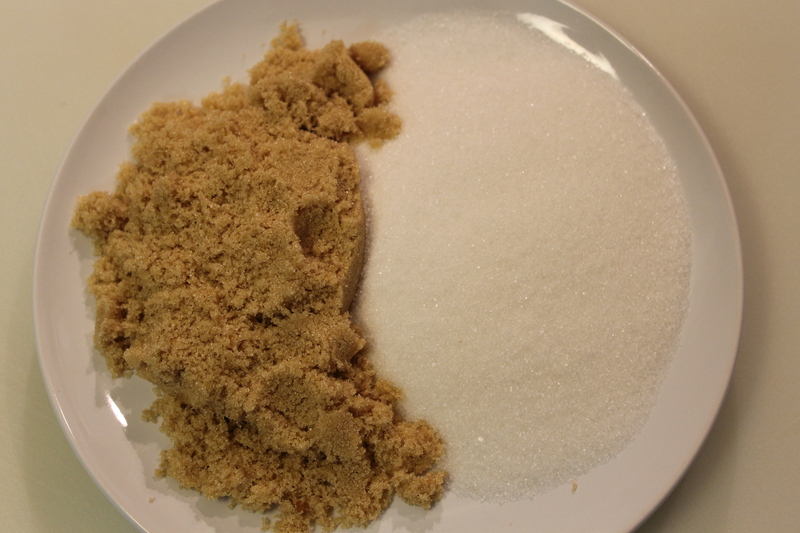 The sugar should be pretty much if not completely dissolved at this point. The crystallization danger has passed. 15 minutes at 238F. The syrup should be clear at this point. 20 minutes at 250F. Now, things start to move fast. It took less than 5 minutes more for the syrup to hit 302F. A tip: When you’re using a larger saucepan, the thermometer may not reach down to the syrup. 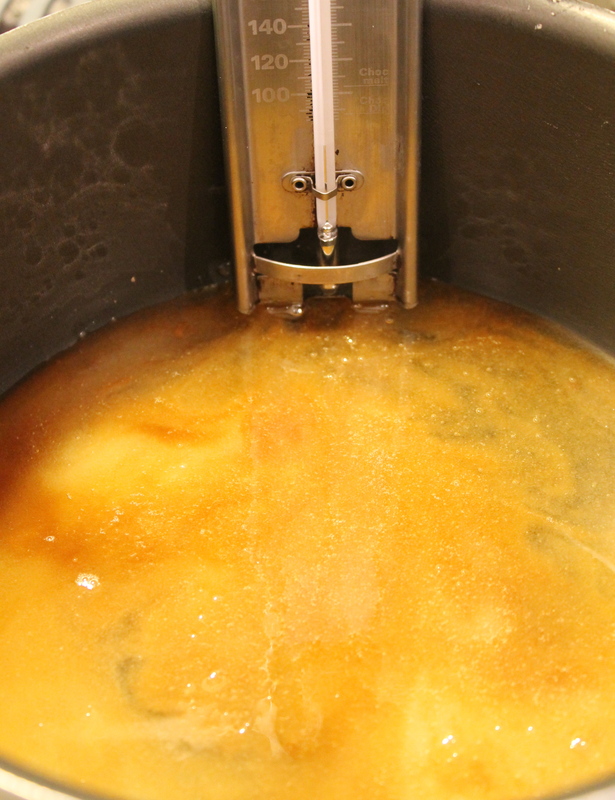 Carefully tilt the saucepan so the syrup covers the bulb of the thermometer so you will get an accurate reading. Also, be patient. It will take some time for the thermometer to read accurately. Wait until the mercury stops moving. Tilting the saucepan to get an accurate temperature of the syrup. Be careful not to spill any onto yourself or the stove. Also, be sure to hold the thermometer so it doesn’t flip off the saucepan (which has happened to me more than once). 4. 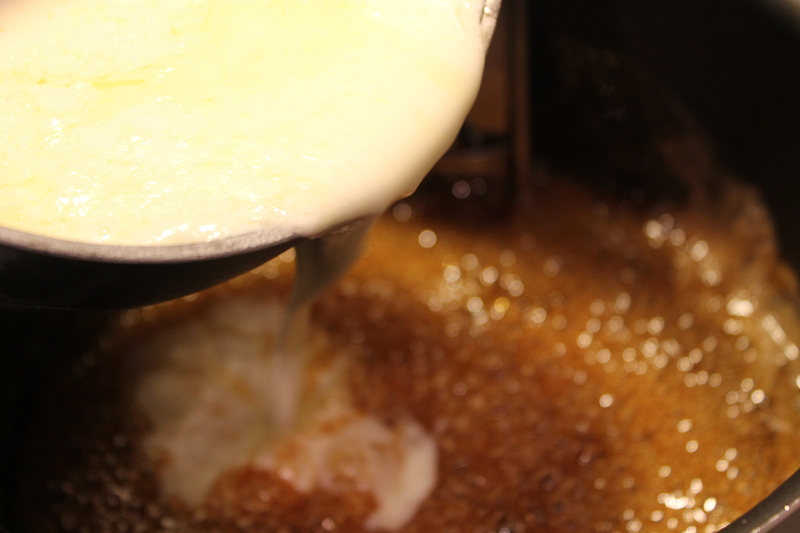 Once the sugar has reached 302F, take the saucepan off the heat, and CAREFULLY pour the warm cream mixture into the syrup, stirring constantly to combine. Pouring the cream mixture into the syrup. Be Careful! Spattering syrup and steam everywhere. Use a long-handled wooden spoon or heat-proof spatula to stir. 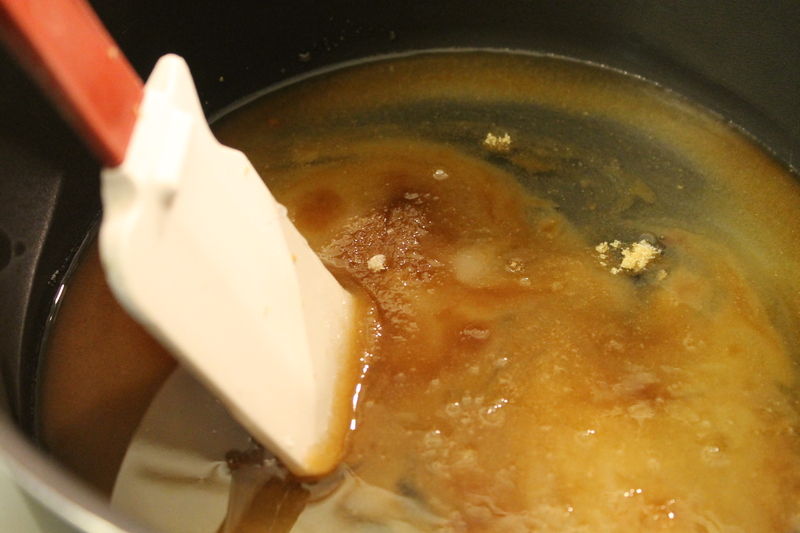 If the syrup begins to harden, place the saucepan back on the heat and continue to stir. Stirring the cream and syrup together. Trust me. It will come together. 5. 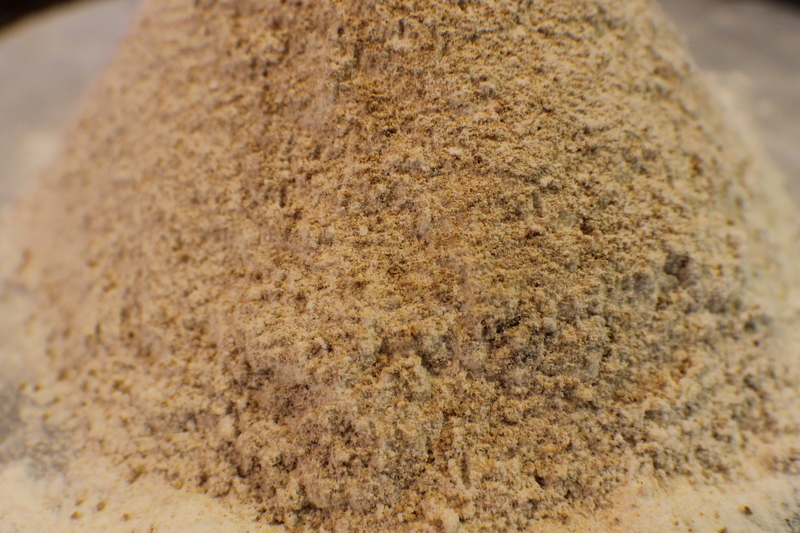 Cook the mixture to 240F (Soft Ball). At this point, it’s OK to stir occasionally. At 5 minutes and 228F. At 10 minutes and 240F. Now, I’m done cooking. 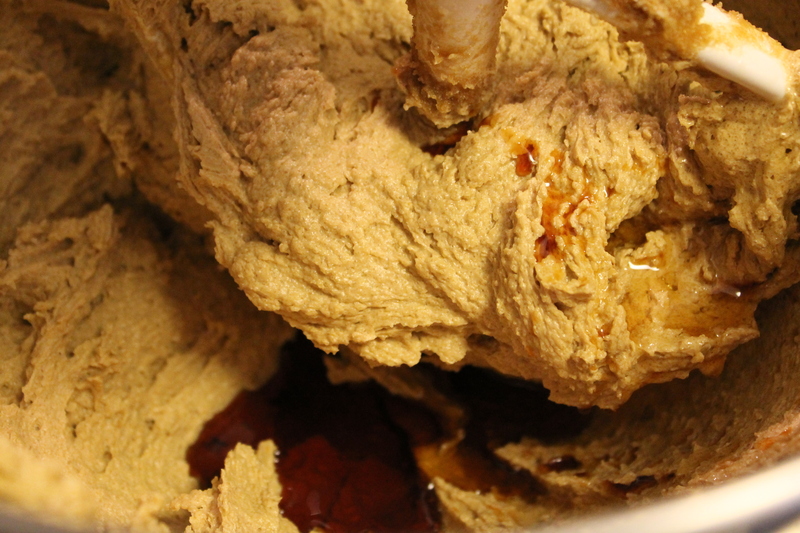 This will make a soft caramel. 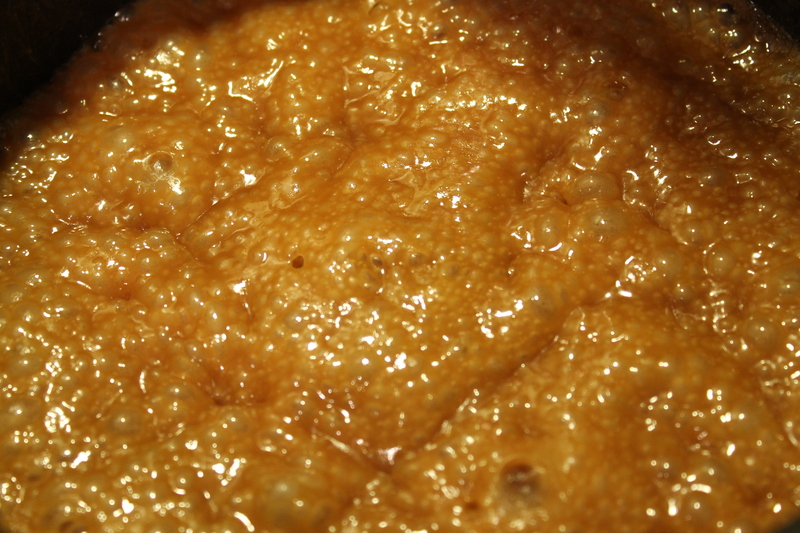 If you want a firmer caramel, cook to 245F (Firm Ball). 6. Take the saucepan off the heat, give the caramel one more good stir, and carefully pour the finished caramel into the prepared pan. The caramel in the pan. 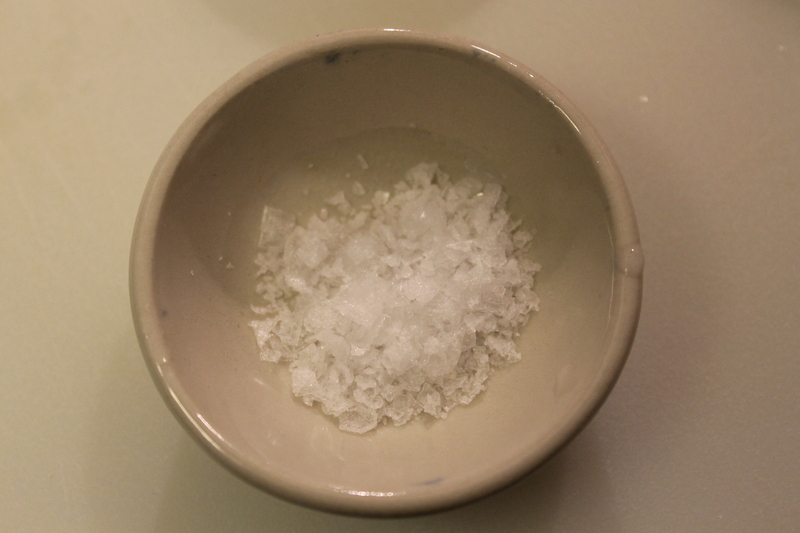 Wait 10 – 15 minutes and the sprinkle on the fleur de sel or flaked sea salt over the top. 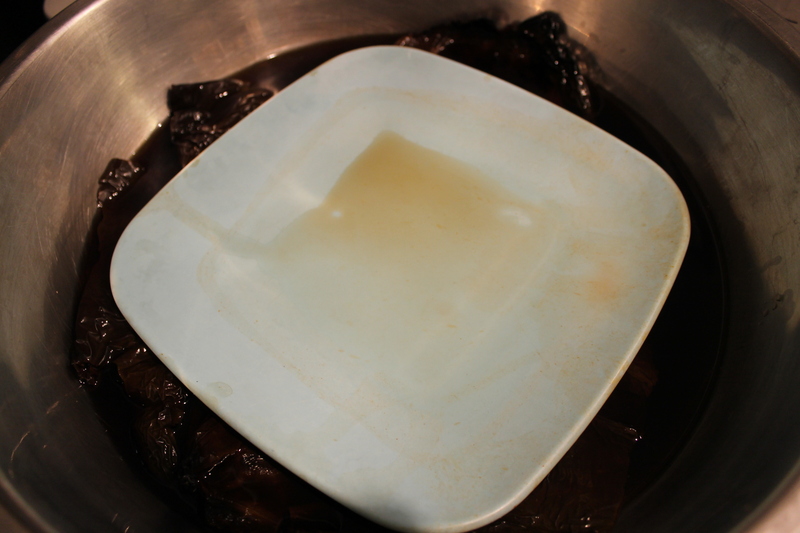 Let the caramel sit until set, at least 2 hours or up to overnight. The salt. it gives a wonderful flavor an has just a little crunch. If you don’t have flaked sea salt, you can use fleur de del. Kosher or table salt won’t work. 7. 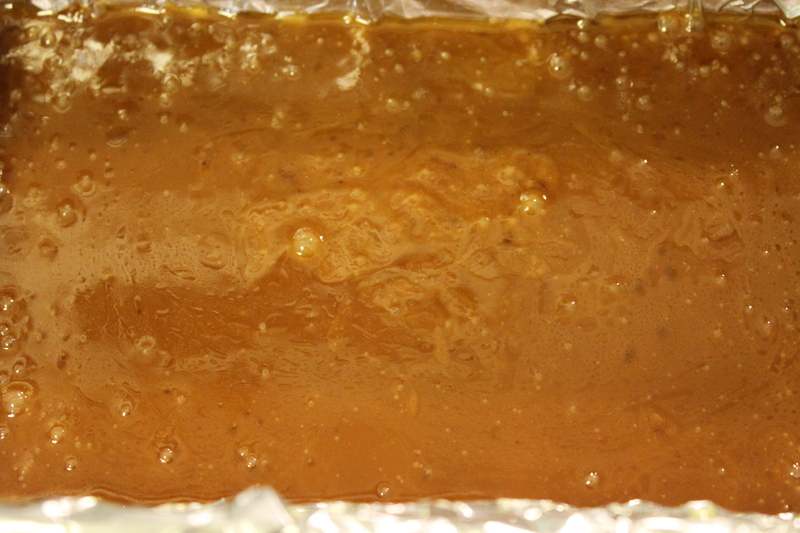 Lift the cooled caramel out of the pan with the paper or foil. 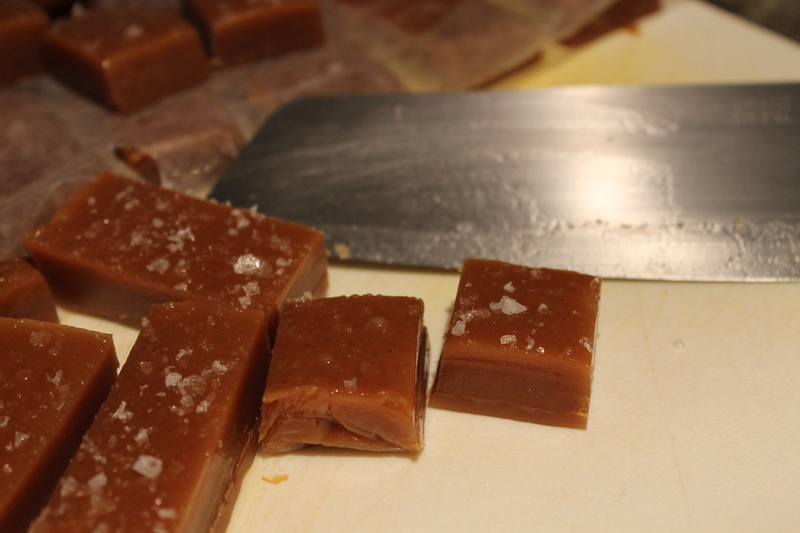 Cut the caramel into pieces as big or as small as you like. 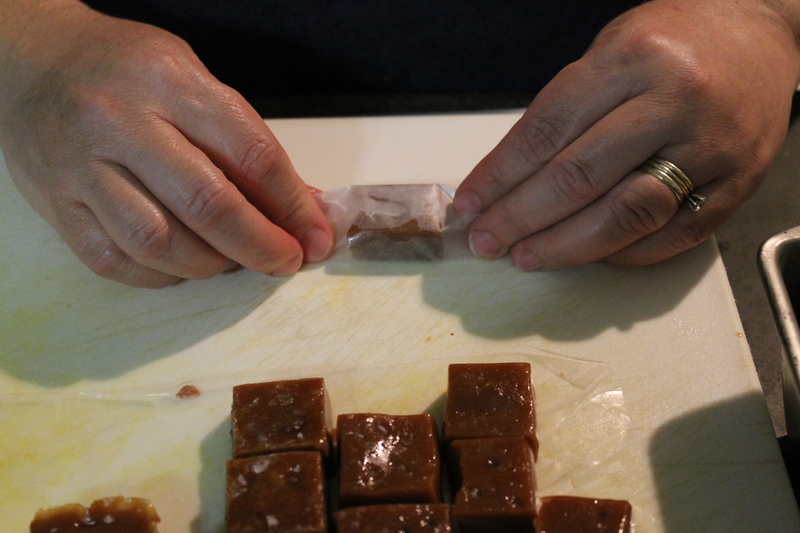 Cutting the caramels. I generally cut it 8×4 and get 32 pieces out of a recipe. If you cut it 8×6, you can get 48 pieces. 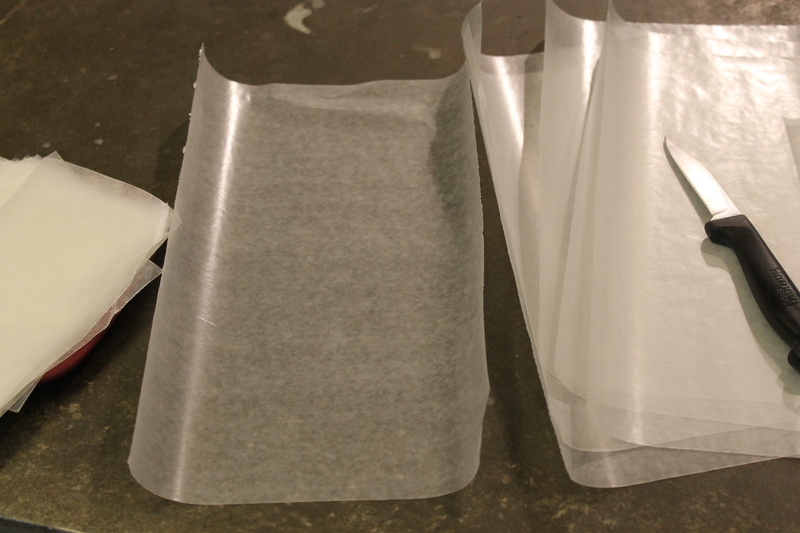 Keep them in an airtight container either individually wrapped or between layers of wax paper for up to 2 weeks. 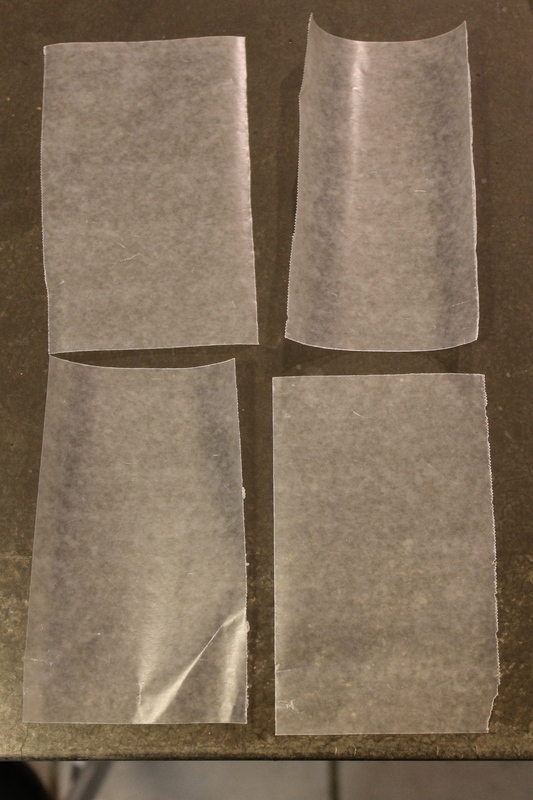 If you decide to wrap the pieces, you can do it simply with wax paper you no doubt have already in the drawer. Don’t go out and buy the fancy wrappers – unless you really want to. I start off with pieces that are about 4″ wide. You don’t really want them any narrower than this. 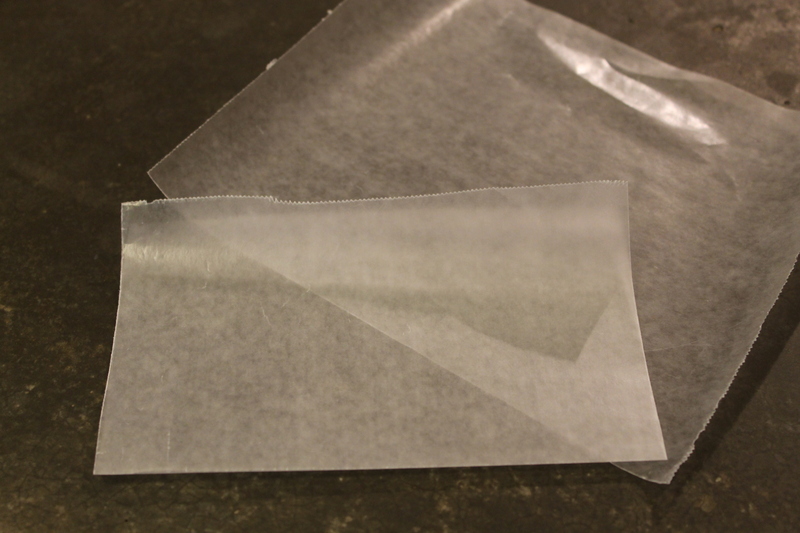 Fold the wax paper lengthwise, making sure the straight edges match. Using a very shark paring knife (this works best), cut along the fold. 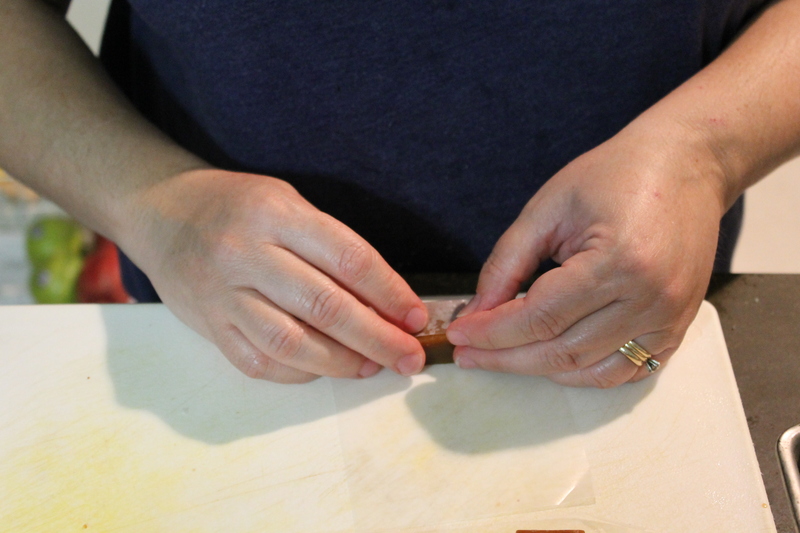 Fold the pieces lengthwise again (narrowest edges matching as closely as possible) and cut along the fold again. What you should end up with. 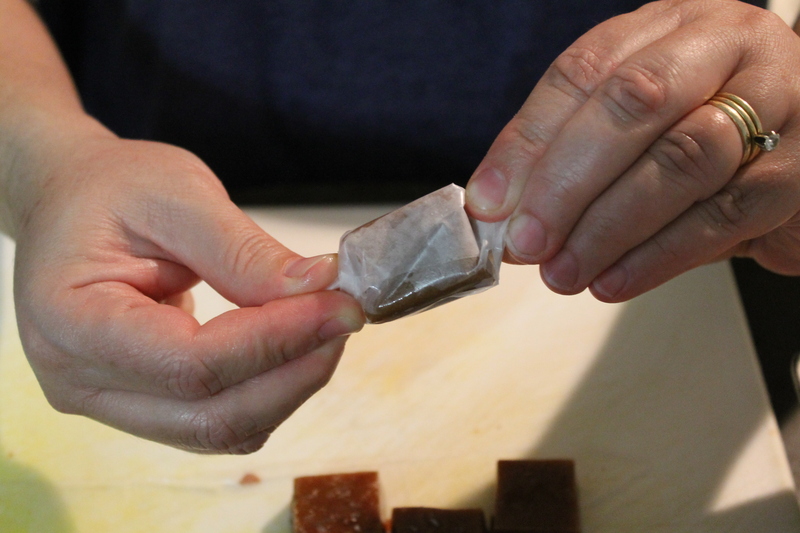 Start by placing a piece of the caramel on a piece of the paper about 1″ from the end closest to you. Continue rolling until you have reached the end of the paper (obviously). Carefully twist the ends to seal. If the paper tears, start again with a new piece. This does get Zen after about the 40th piece. Makes approximately 32 – 48 pieces. Once again, the weather has taken its temporary turn towards cool & comfortable here in Central Texas. The perfect excuse to break out the mole. Again. I’ve made mole twice before on this blog – Mole Verde (Oct. 9, 2012: http://www.tartqueenskitchen.com/?p=1120) and Mole Rojo (Oct. 30. 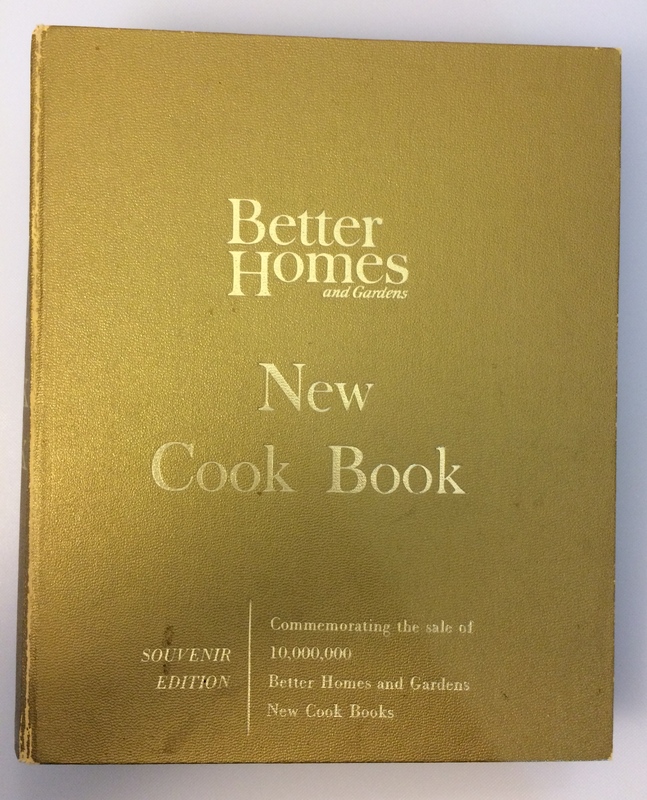 2012: http://www.tartqueenskitchen.com/?p=1170). 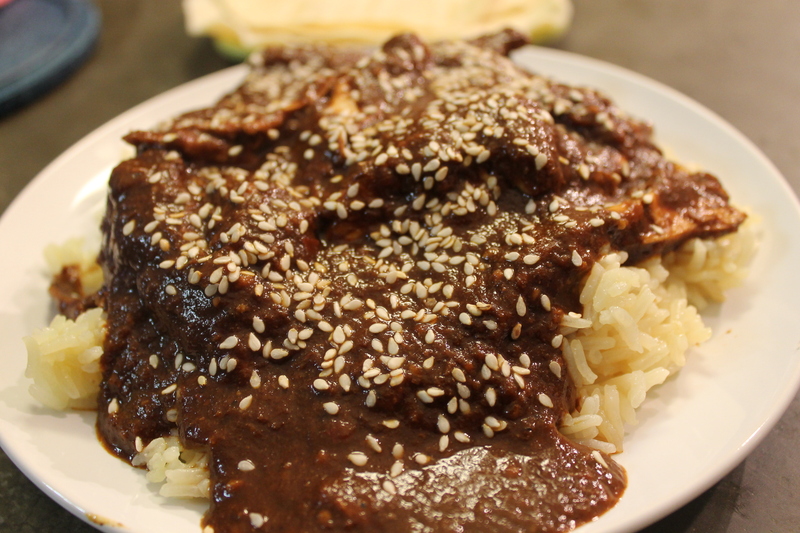 The mole I’m making this time is probably the best known as well as the original: Mole Poblano. Legend has it that in the 16th Century this dish was invented in desperation by the nuns of the Convent of Santa Rosa in Puebla de los Angeles. They were an impoverished order expecting a visit from the Archbishop and they really had nothing to feed him. So, they basically threw together what they had: day-old bread, chocolate, some chiles, nuts, an old turkey. The results were, shall we say, heavenly. Apparently, the Archbishop loved the meal. And a masterpiece was created. 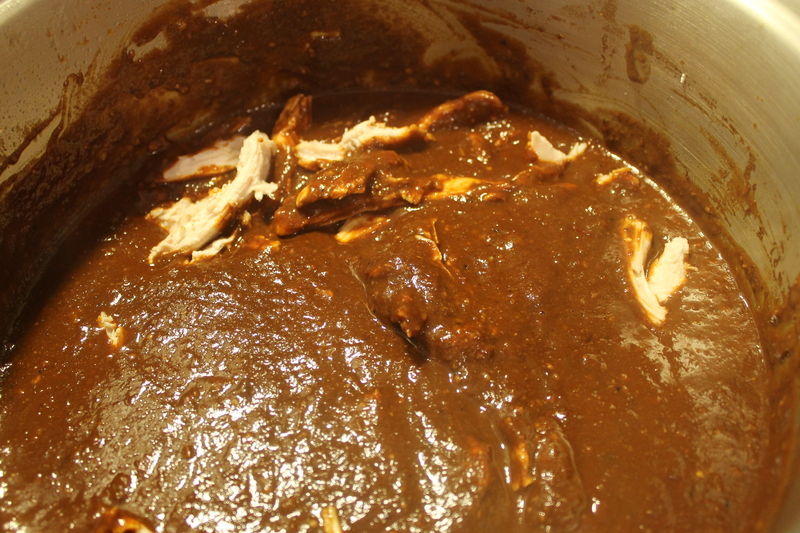 For the last mole I made for you, Mole Rojo, I used exclusively chili powders. 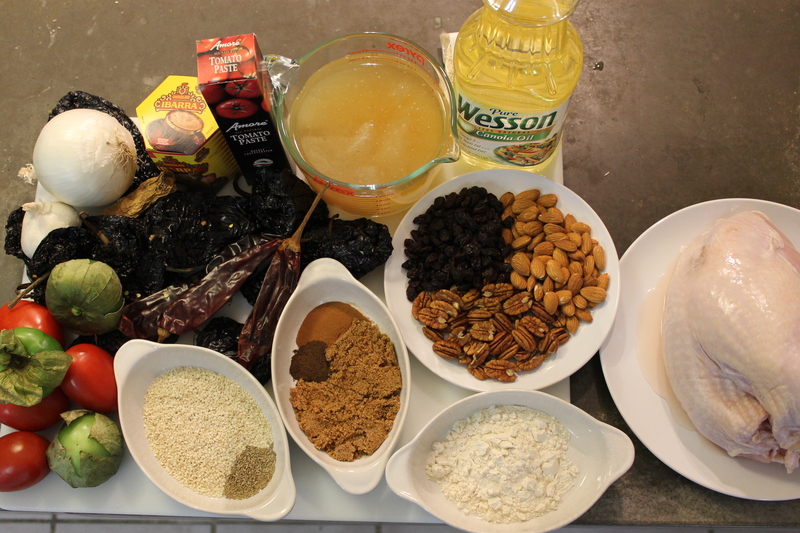 This was to demonstrate that they could be used as a substitution for the dried chiles and makes the preparation much easier. 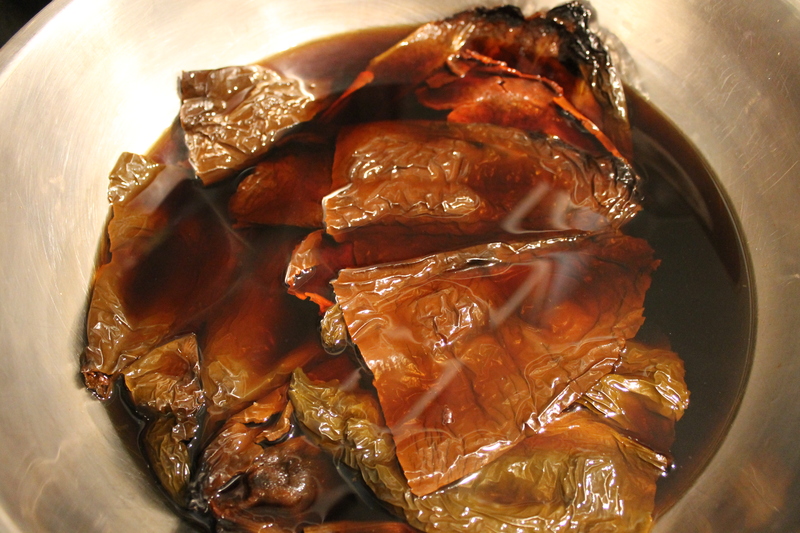 In this recipe, I do things the more traditional way, with dried chiles. It takes longer, most definitely. 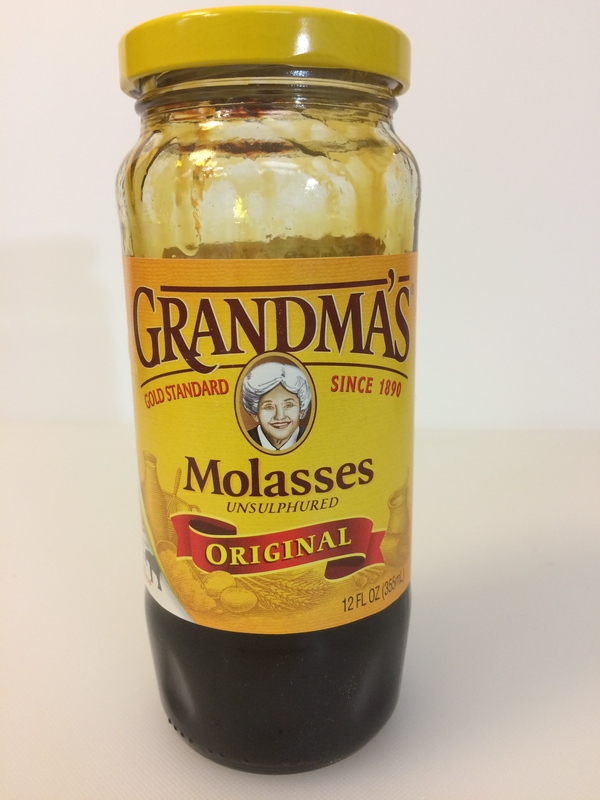 But, for mole purists, I hope I have redeemed myself with you. 1. 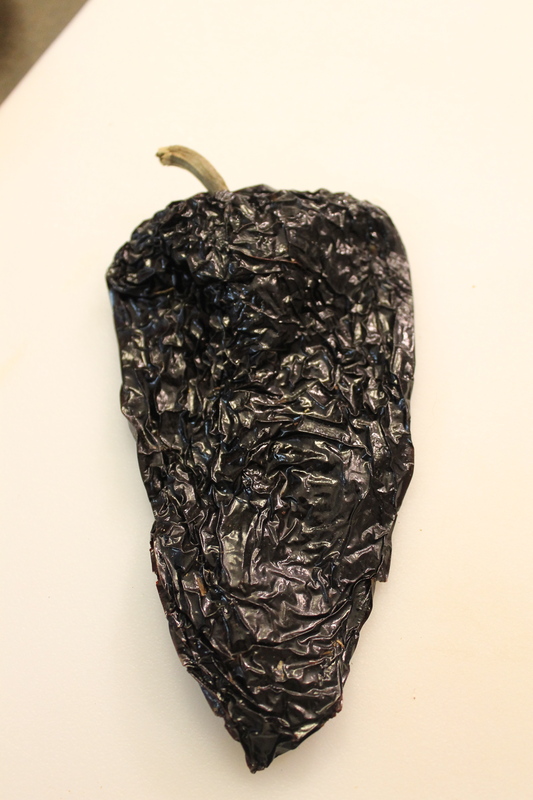 When using the dried chiles, make sure they are fresh-looking and pliable (a contradiction, I know). 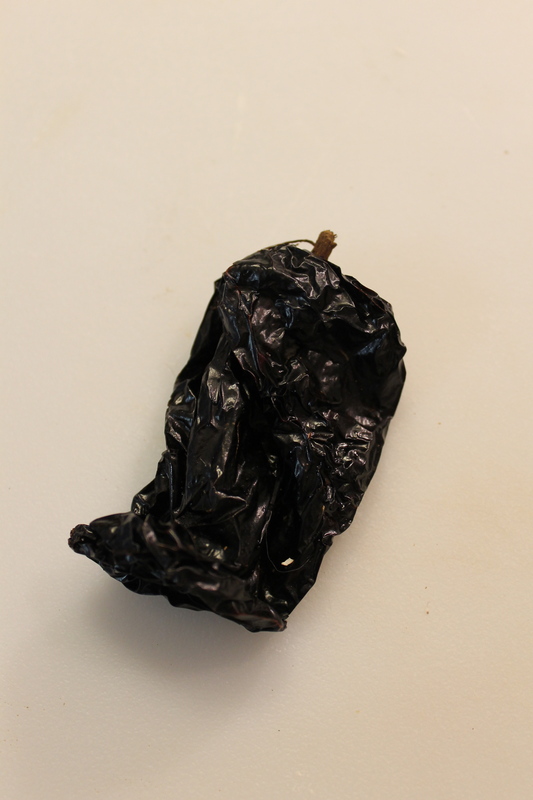 If the chiles break apart when you try to bend them, it simply means they are too old and dried out (and possibly infested). You want the chilies to have retained their essential oils. That’s what gives them their flavor and aroma. 2. The best place to find the chiles (and all the ingredients for this recipe) is at a market that caters to the Hispanic community. (Here in Austin, my favorite is El Rancho Supermercado.) If they don’t have it, it’s pretty unlikely anyone else will. Besides, it’s a great place to go to just explore and try new things. Plus I get to practice my limited Spanish. 3. I used a 4-lb bone-in turkey breast for this example. You can use leftover turkey and skip step 1. However, be sure to use chicken or turkey broth instead of water. Otherwise, you won’t get the flavor you’re looking for. 4. This recipe makes a lot. You can serve up to 8. But, it does freeze beautifully. 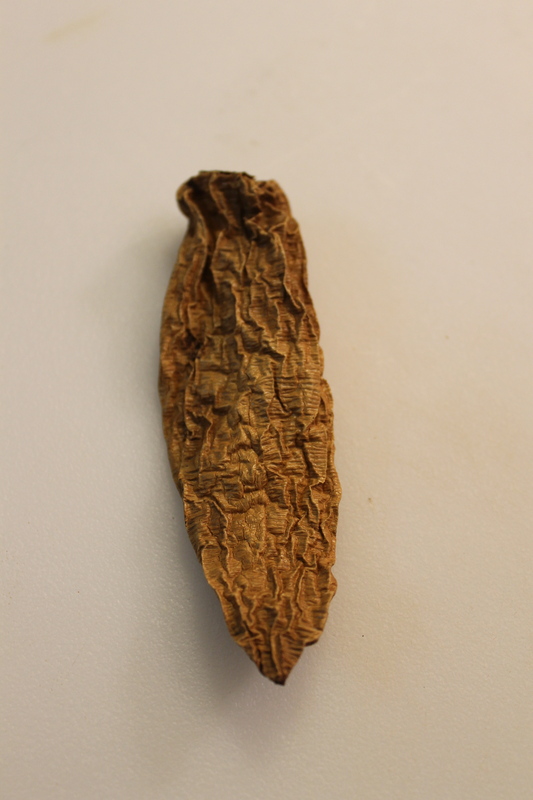 Pasilla Chilie – dried Chilaca pepper. 1. 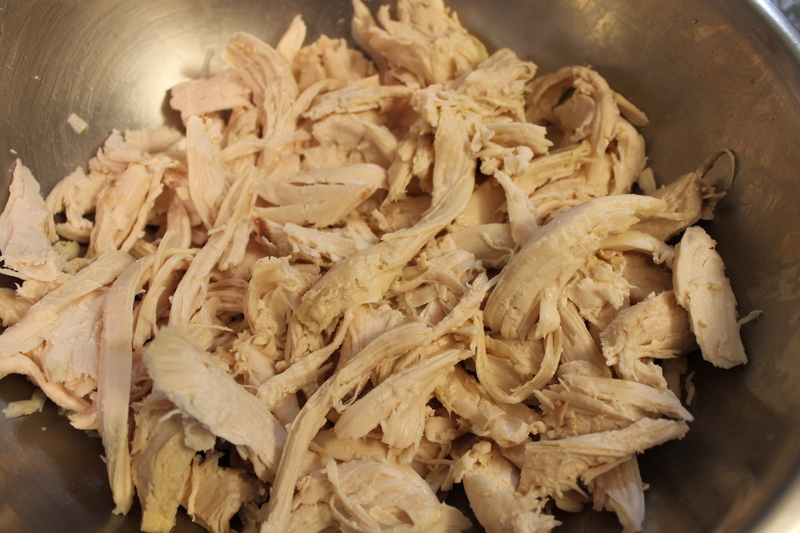 Place the turkey and stock or water to a large stockpot and heat over medium-high heat. 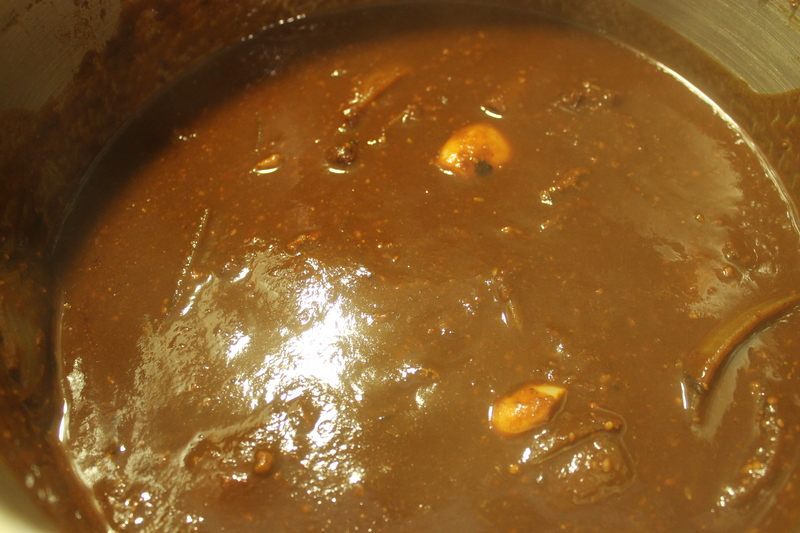 Once the stock has come to a boil, turn the heat down to medium-low and simmer until the meat is cooked, about 30 – 45 minutes. Once the turkey is done, take it from the stock and set aside until cool enough to shred. Turn the heat off under the stock until all the other ingredients are ready. 2. 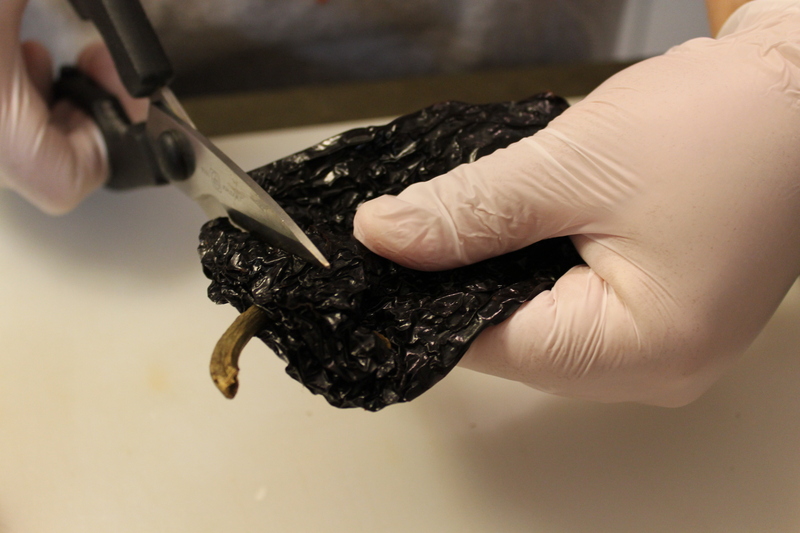 If you’re using whole chiles, remove the stems and cut the chiles open to remove the seeds. Cutting the stem off the chile. Using gloves is highly recommended. This not only keeps your hands from getting stained and sticky, it keeps the chile oils off your hands. A pair of sharp kitchen shears helps, too. The insides. 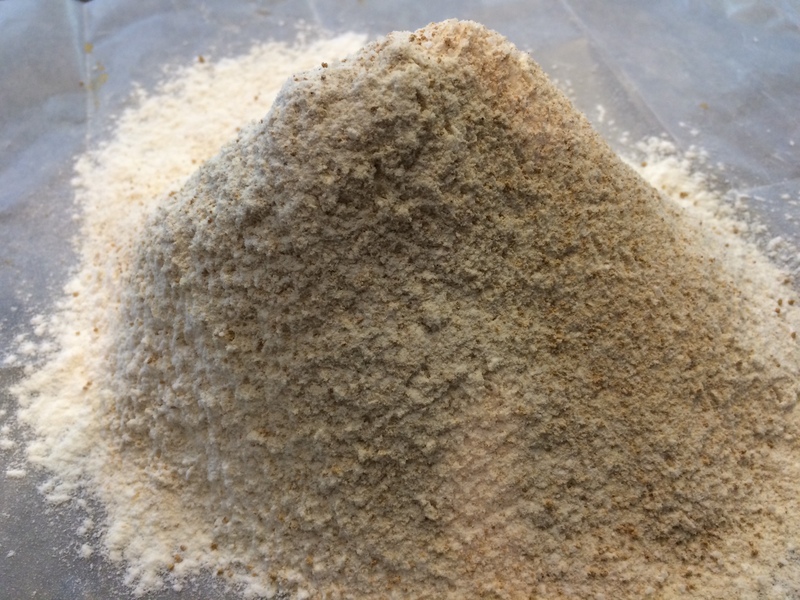 You want to get rid of as many seeds and veins as possible. They’ll make the final mole bitter if you don’t. 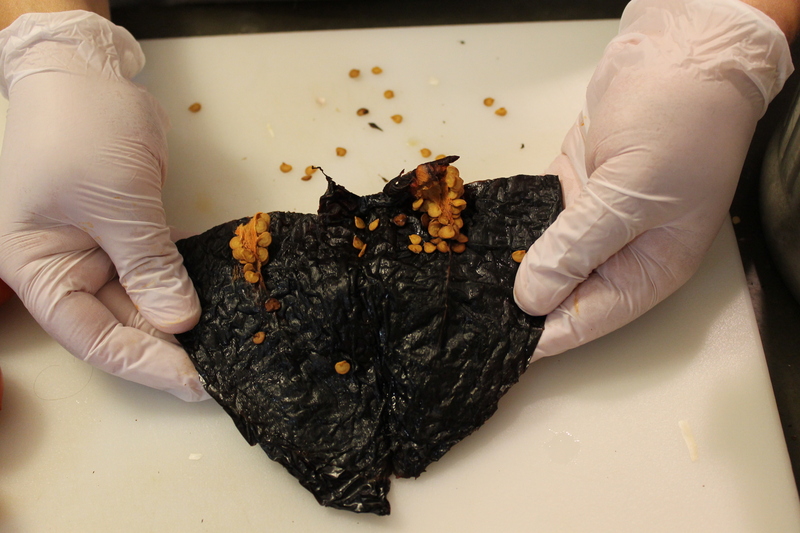 Removing the seeds and veins. 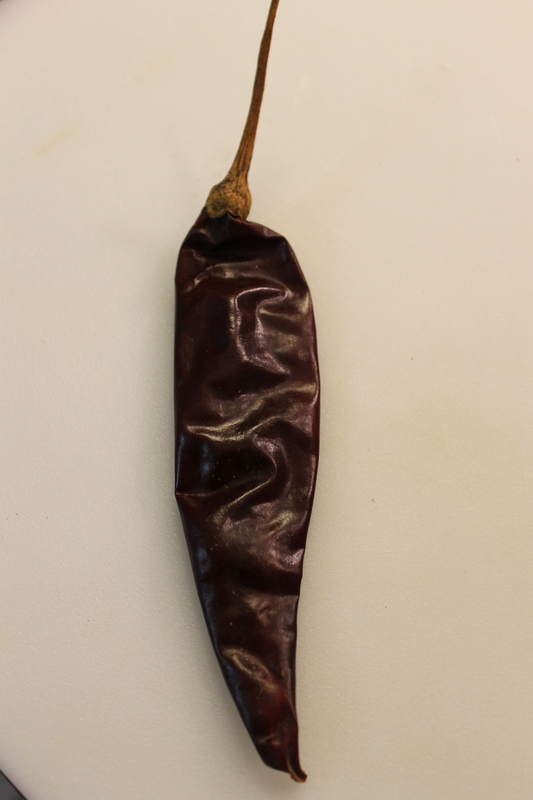 If you have a good dried chile, there will be some oil residue inside. This is a good thing. And, again, the gloves are a very good idea. 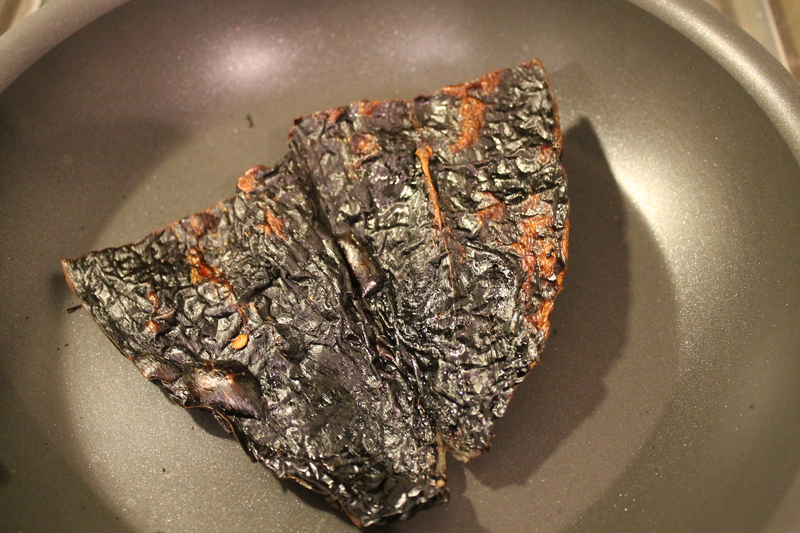 Dry roast the chiles in a heavy skillet over high heat for a few seconds on each side to soften slightly. Toasting the chiles. This not only helps to soften them up a bit, but it also starts to cook the oils and enhance the flavor. Soaking the chiles. I like to put a small plate on top to keep them under water. 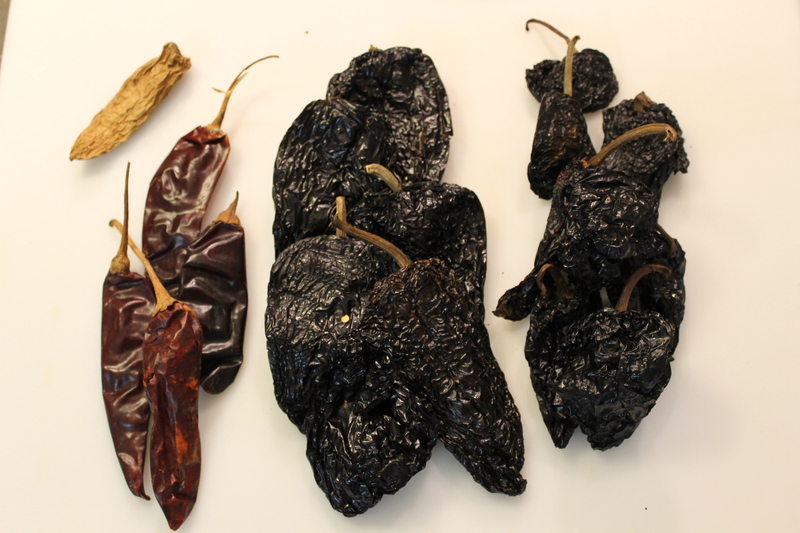 Drain the chiles and discard the water. 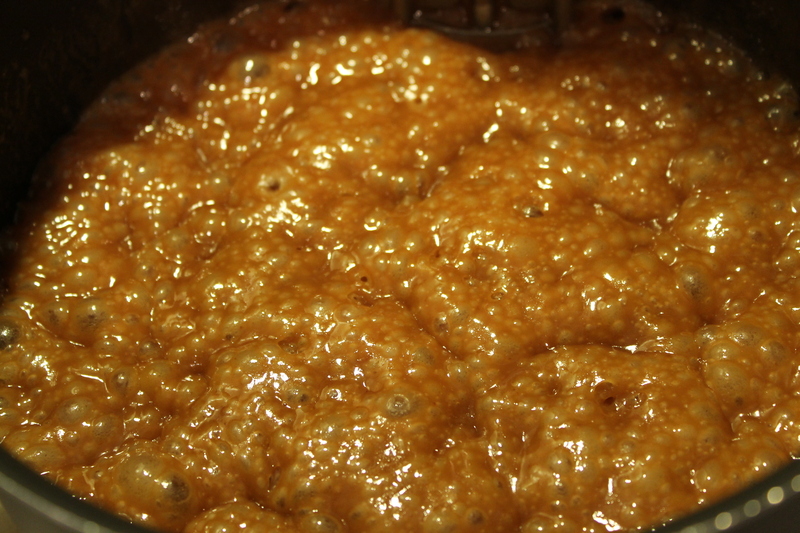 Puree the chiles in a food processor or blender (you’ll need to do this in batches) until you make a paste. Set aside. 4. 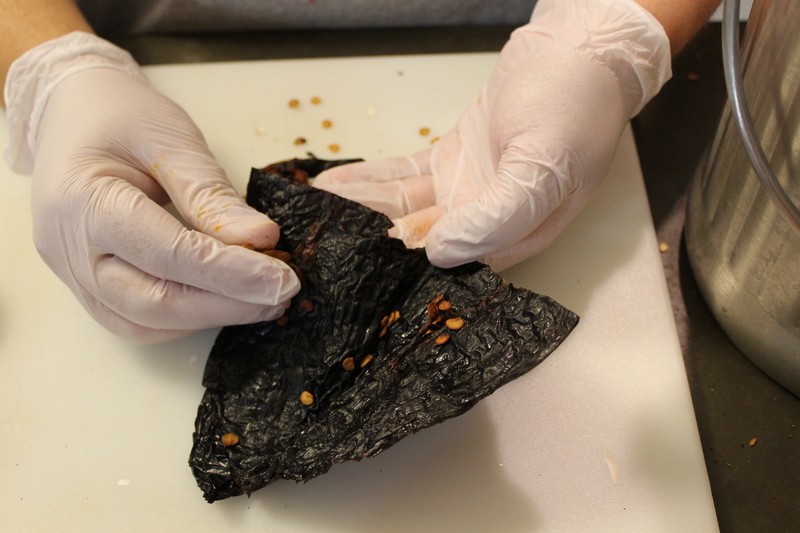 While the chiles are soaking, wipe out the pan. 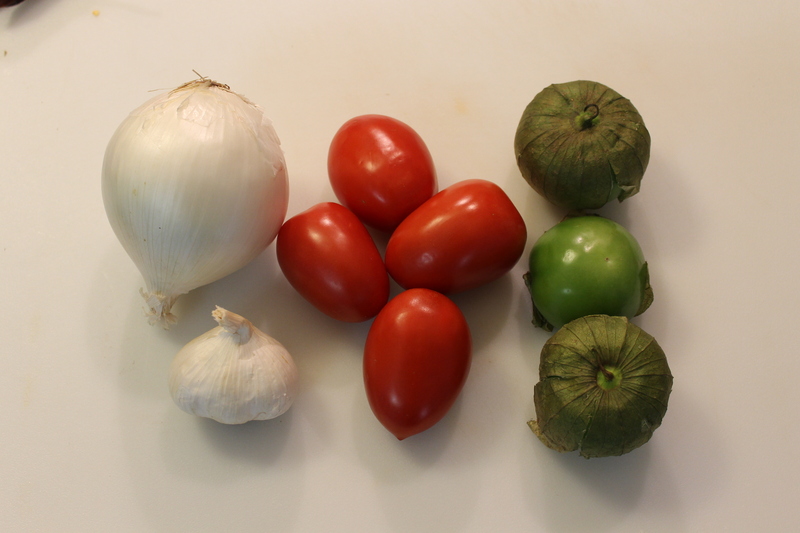 Dry roast the onion quarters, garlic, tomatillos, and tomato. You want black spots, but you don’t want to over-brown the vegetables. 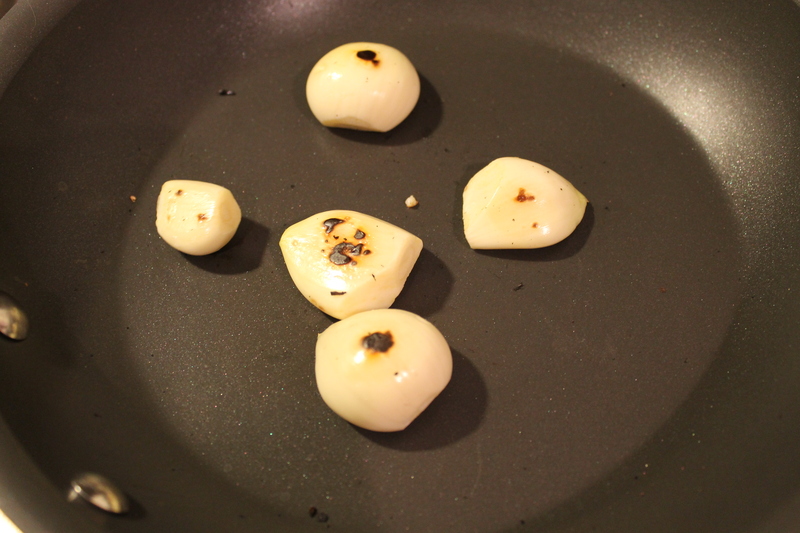 Browning the fresh stuff: Starting with garlic. You just want a few brown spots; don’t over-brown. Browning the onion quarters. Once these are cool enough to handle, cut off the stem ends. The tomatillos. 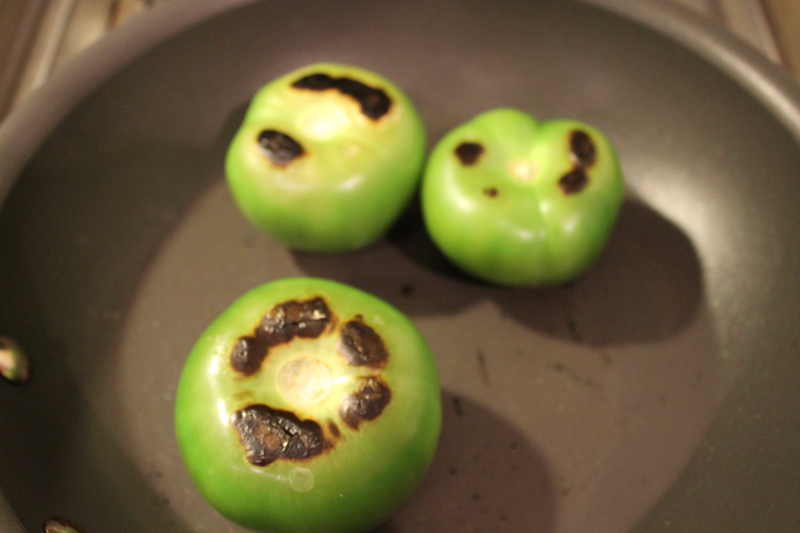 Be sure they don’t burst in the skillet. The Romas. Be sure they don’t burst in the skillet. When they are cool enough to handle, peel off as much of the skin as you can, cut off the stem end, cut into quarters, and remove the seeds. 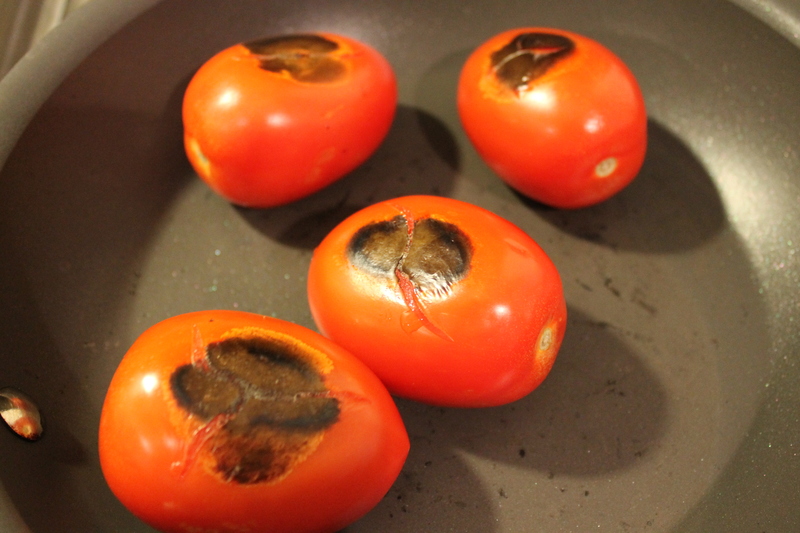 Once you’ve roasted the tomatoes, peel and seed them. Cut the stems off the onion quarters. Set the vegetables aside. 5. Take the skillet off the heat and let cool slightly. 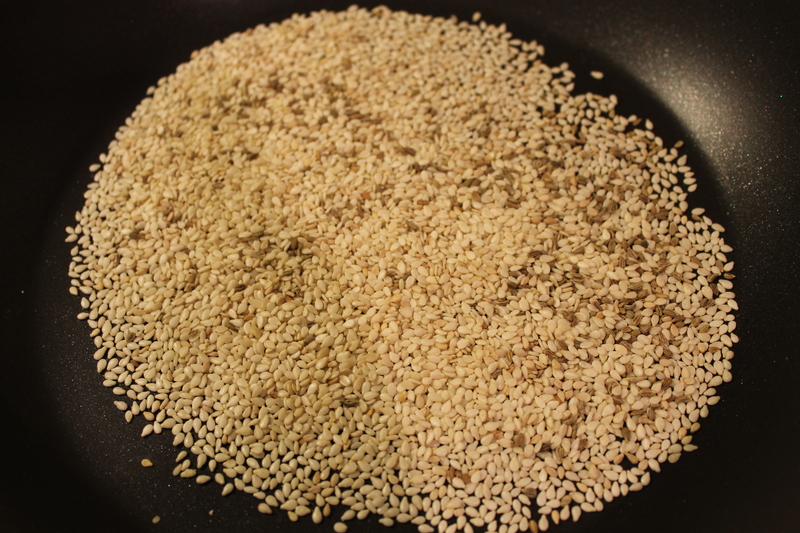 Add the sesame seeds and anise seeds. Quickly roast until the seeds are toasted. Pour onto a small plate and set aside. 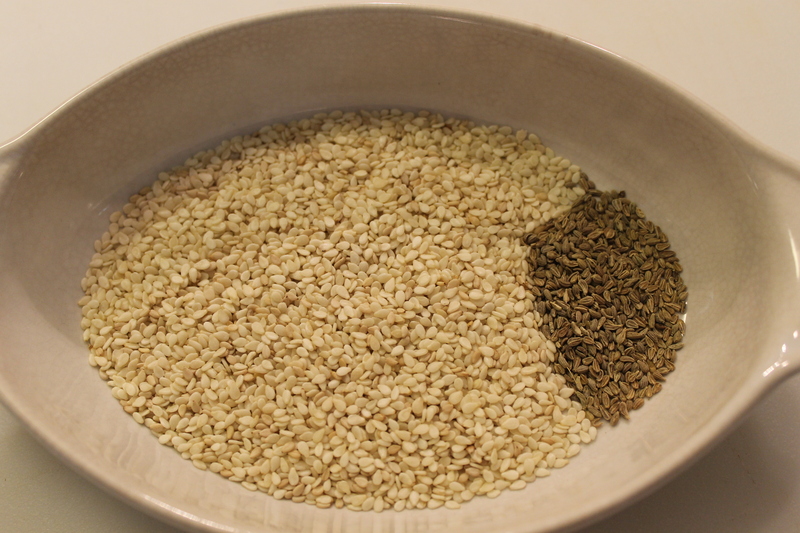 Toasting the sesame and anise seeds. 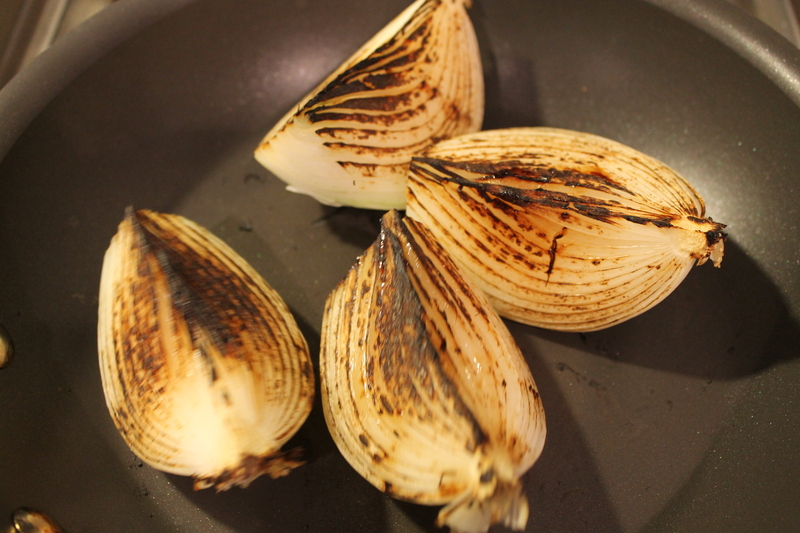 You want them to have an aroma and begin to “jump” in the skillet. 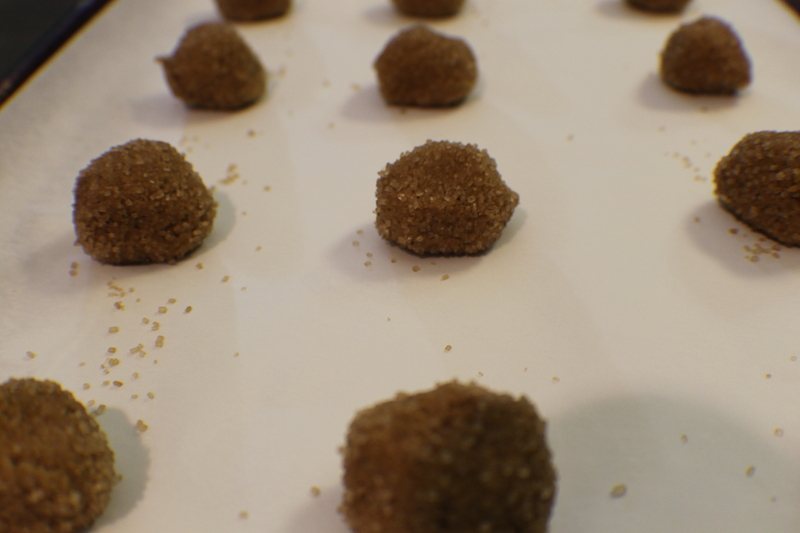 Immediately take them off the heat and pour onto a flat surface and spread out to cool. 6. Add the oil to the skillet. 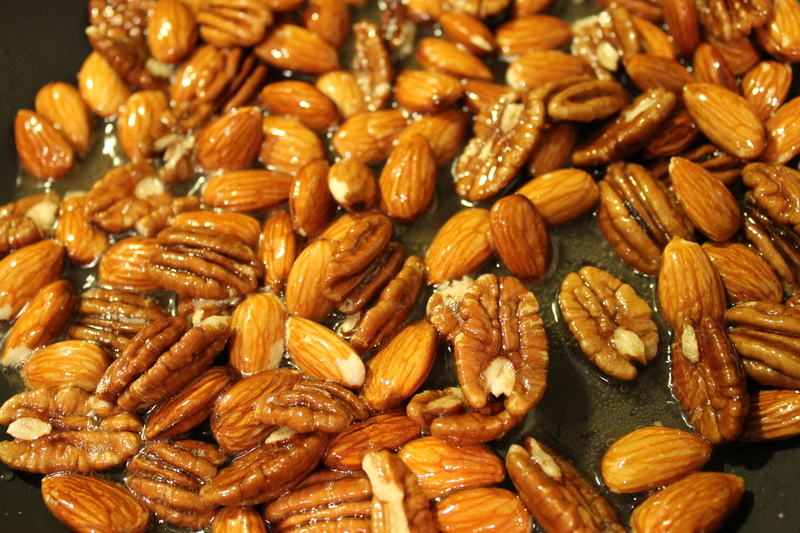 Lightly fry the almonds and pecans. Drain on paper towels and let cool slightly. Frying the pecans and almonds. You just want to do this until they begin to take on some extra color. 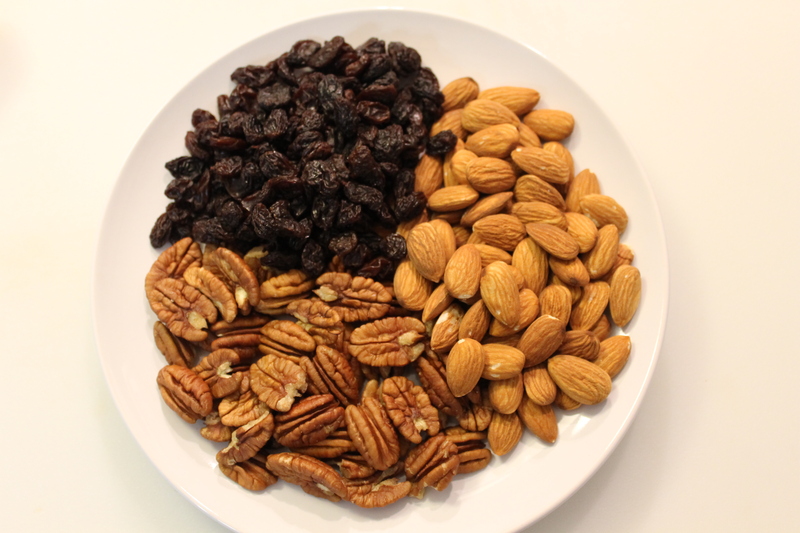 Grind the almonds, pecans, sesame seeds, and anise seeds together. Set aside. The ground nuts and seeds. This smells amazing. 7. 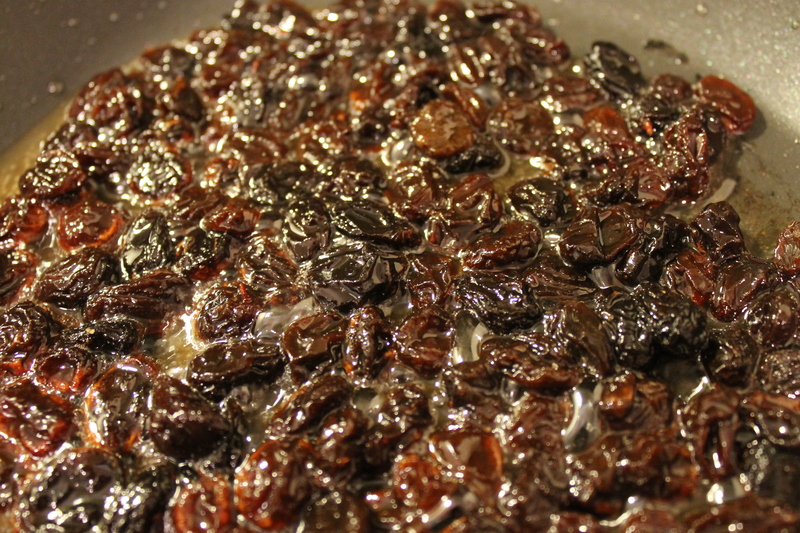 Lightly fry the raisins until they just begin to puff. Remove from the oil and drain on paper towels. 8. Turn off the heat under the oil. 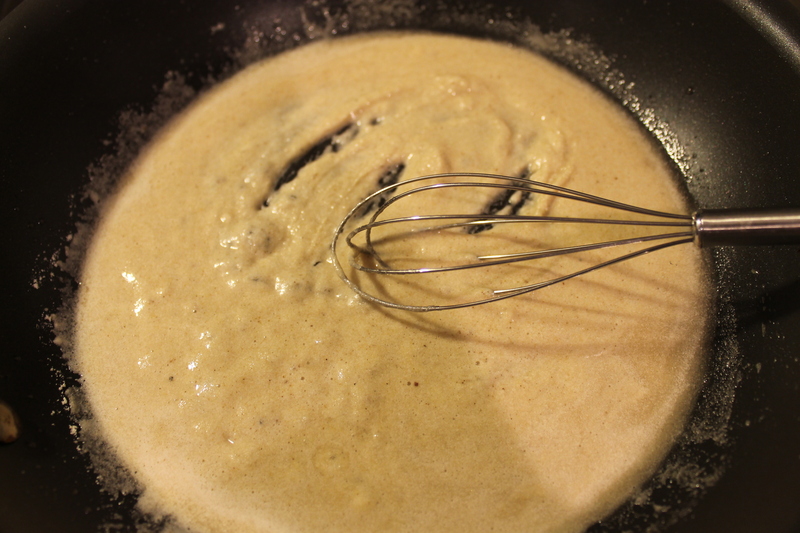 Add the masa and make a roux (don’t let it get too dark). 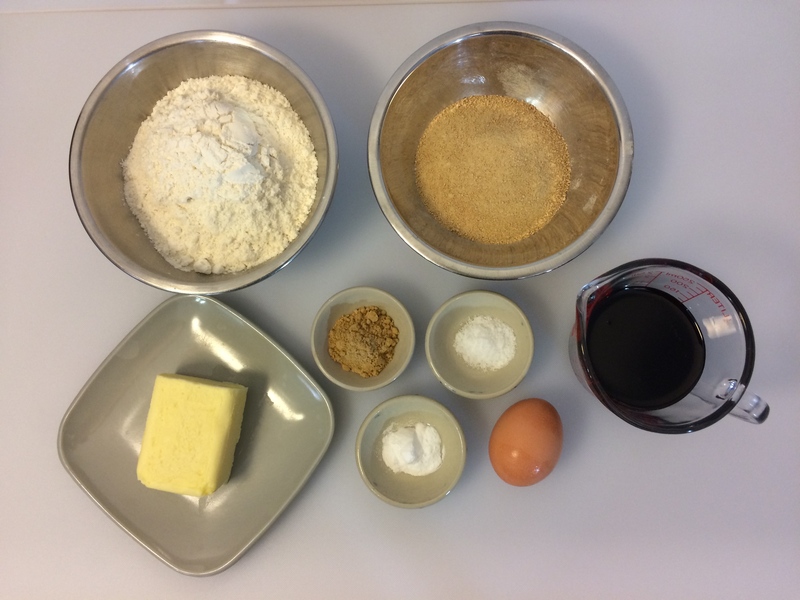 Pour the roux into a small bowl and set aside. Making a roux with now a rather flavorful oil. 9. Turn the heat back on under the stockpot with the broth to medium-high. Add in the chile paste or powder, onion, garlic, tomatillos, tomatoes, ground nut & spice mix, raisins, tomato paste, brown sugar, cloves, cinnamon, and 1 teaspoon each salt and pepper. Bring the mixture to a boil, lower the heat to medium-low, and cook for 45 minutes, stirring frequently. Almost everything in the pot with the chicken/turkey stock. 10. Meanwhile, shred the turkey. Discard any bone, skin, and gristle. Set the turkey aside. Shredded turkey. In this recipe, I used turkey breast; however, use whatever you prefer. 11. After 45 minutes, remove the stockpot from the heat and let cool slightly. After 45 minutes. 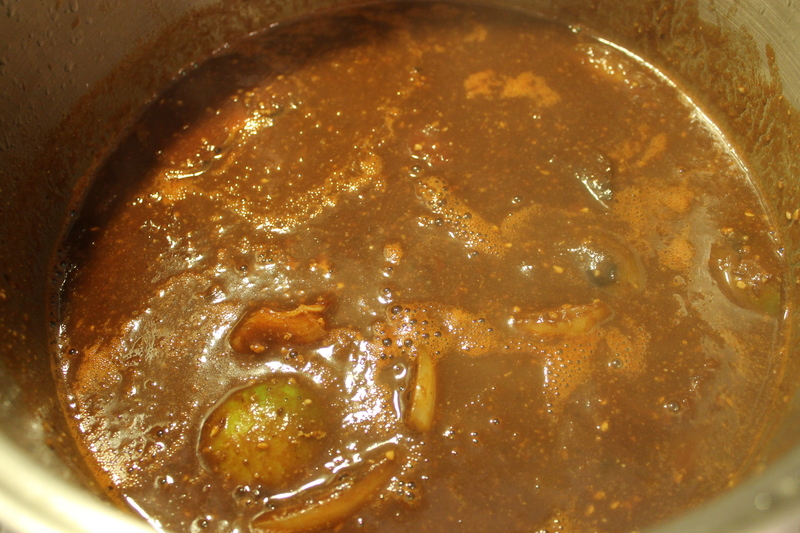 The vegetables have softened and the ground nuts have helped to thicken the sauce. 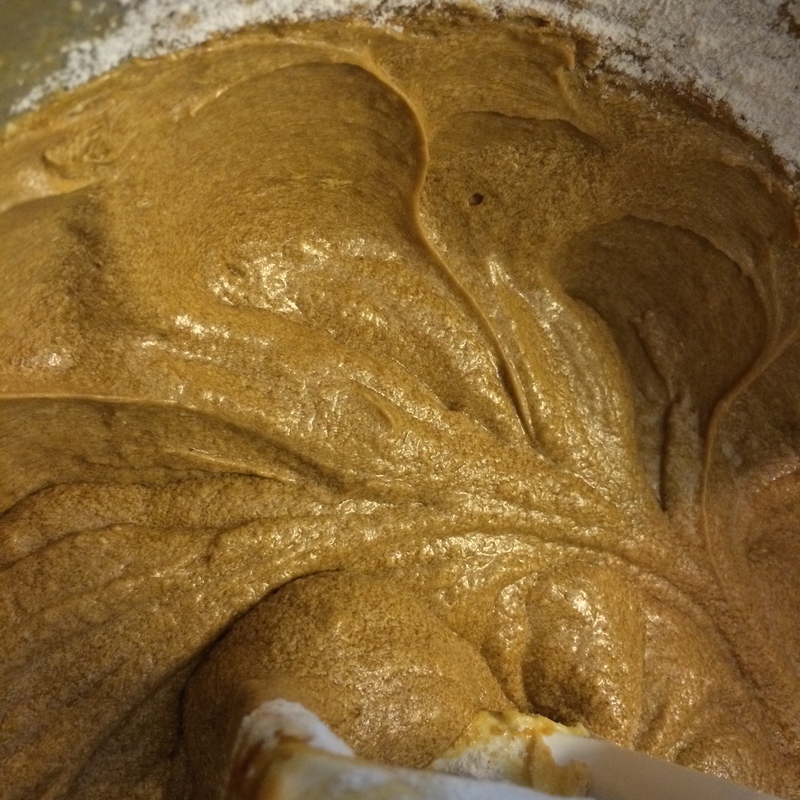 Puree the mole with an immersion blender or in a blender or food processor. 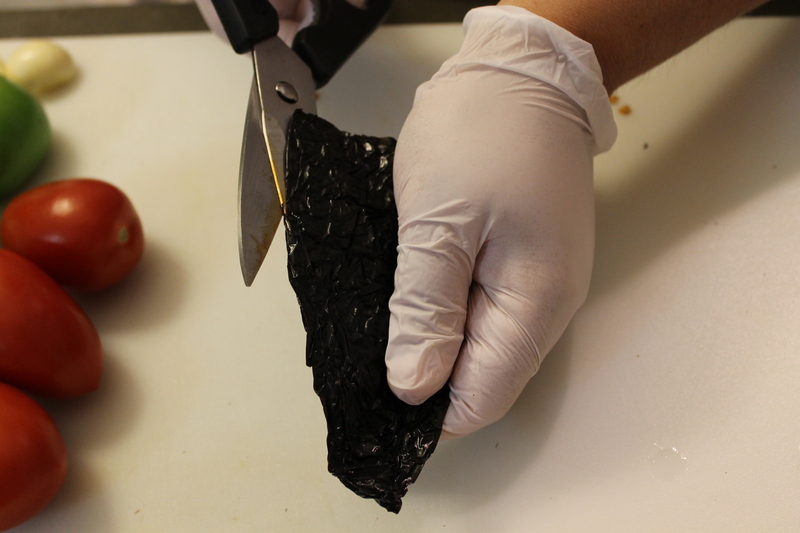 If you want a super-smooth mole, after you’ve pureed it, you can pass it through a strainer. 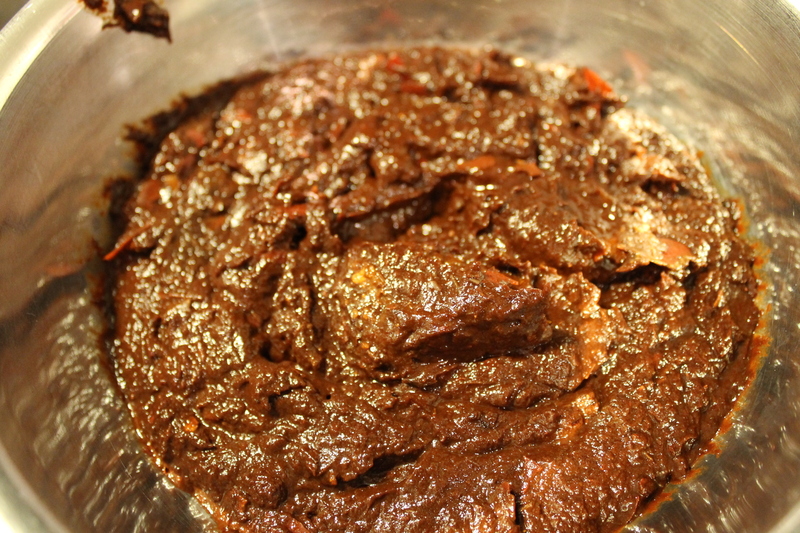 Thoroughly puree the mole. Make sure the blender isn’t running when you pull it out of the hot liquid. Bless whoever invented the immersion blender. 12. 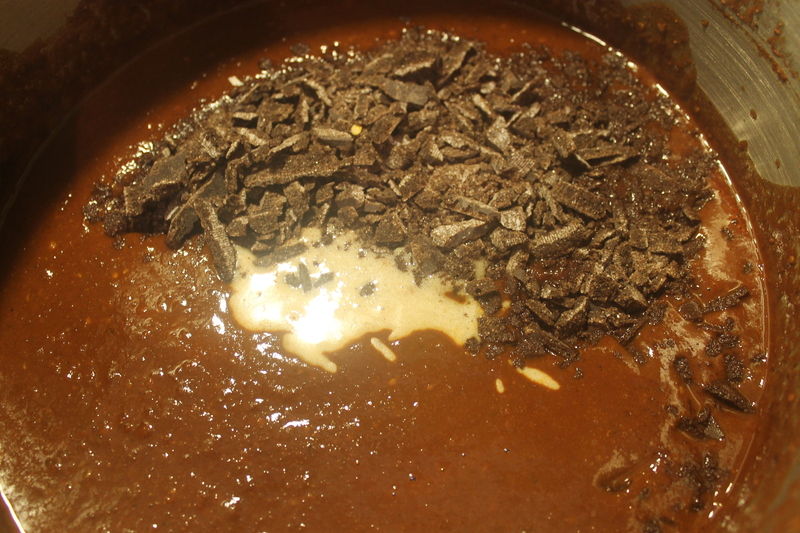 Put the mole back on the heat and add the masa roux and the chocolate. 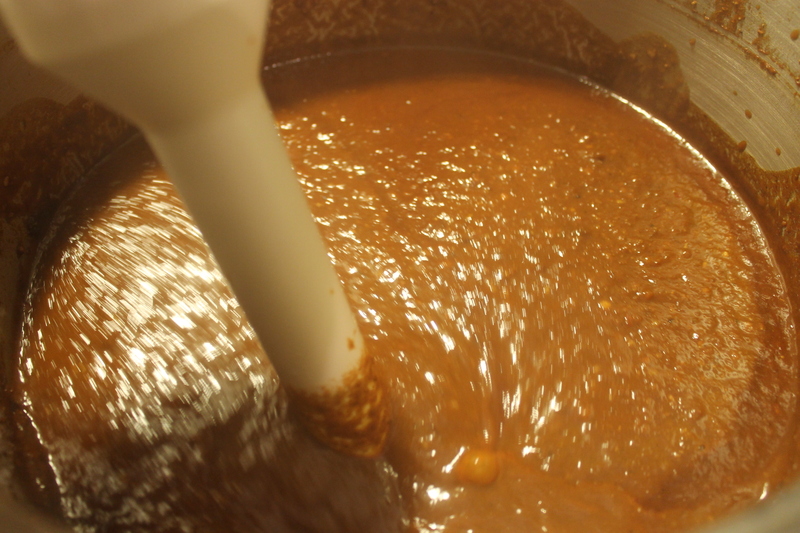 Adding the masa roux and chocolate. They just melt right on in. Cook for 5 minutes. Taste for seasoning. Add the turkey and cook for another 15 minutes, stirring frequently. 13. Serve the mole with rice and corn tortillas. Sprinkle with sesame seeds for garnish. The ultimate reward for all your hard work.